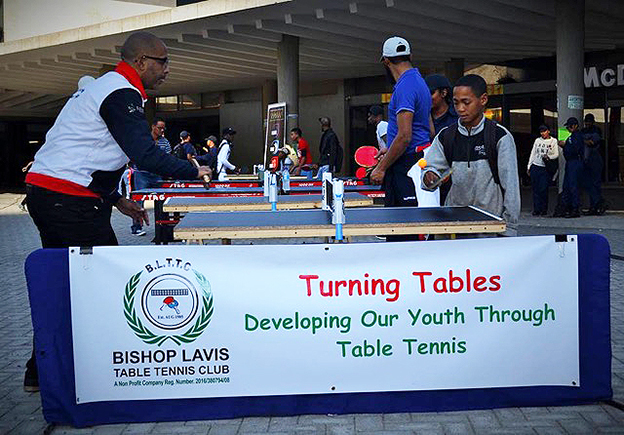 Thanks to all involved with Bishop Lavis Table Tennis Club over the last year, we have one more Tournament to attend and a celebration of our years activity. 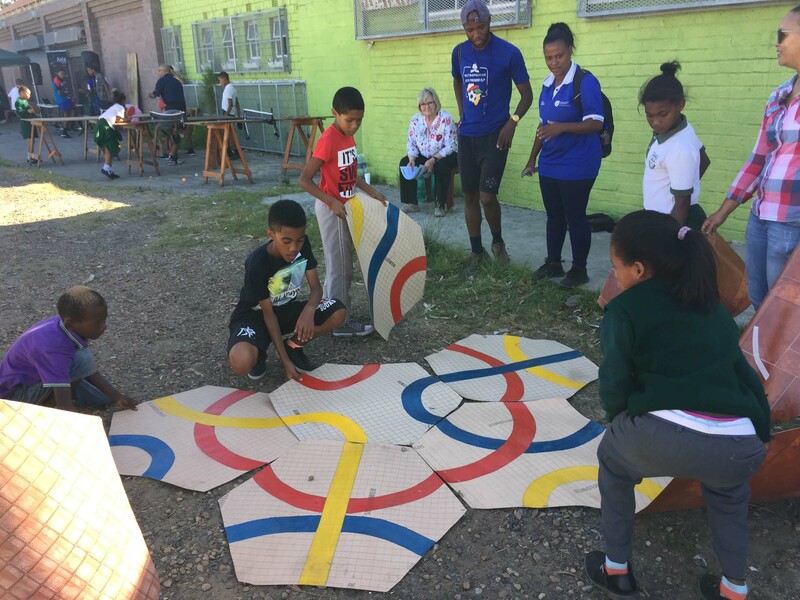 We have had a brilliant 2018 and look forward to an amazing 2019. 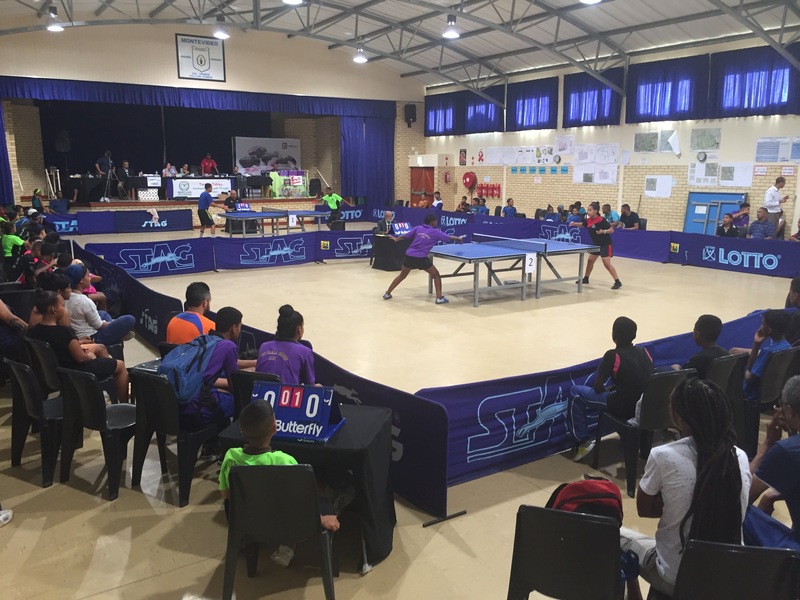 StatPro Group PLC faced the Bishop Lavis Table Tennis Corporate Champions Challenge with stealth and plenty ping! 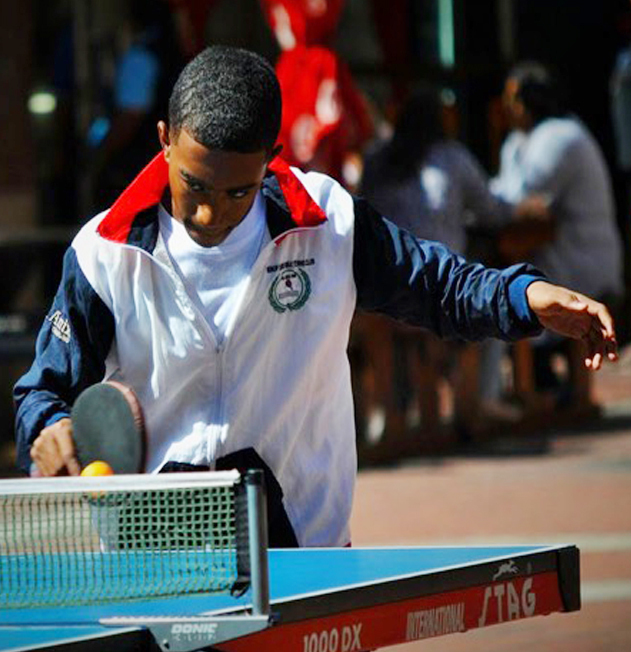 After a few sessions training with 2016 Junior National Champion; Byrone Abrahams and BLTTC Coach; Denver Titus the StatPro team’s skills were tweaked and fine-tuned and ready for action. 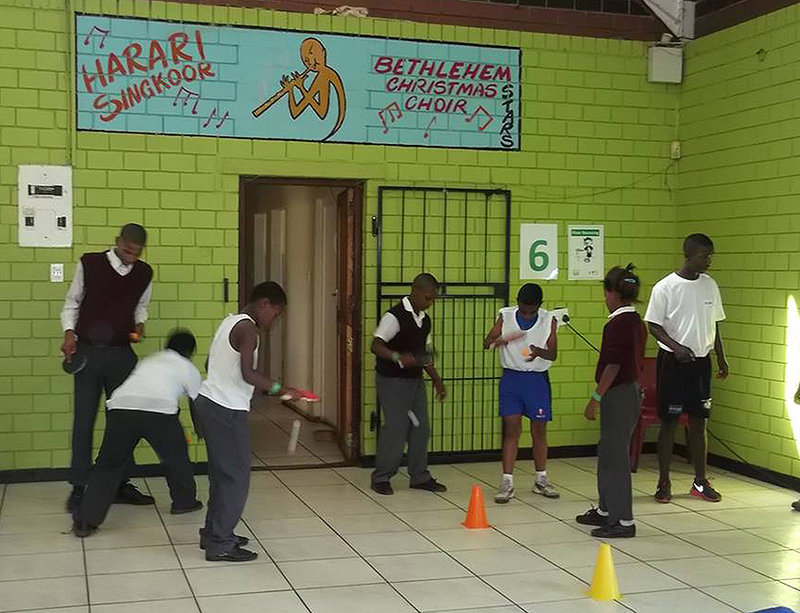 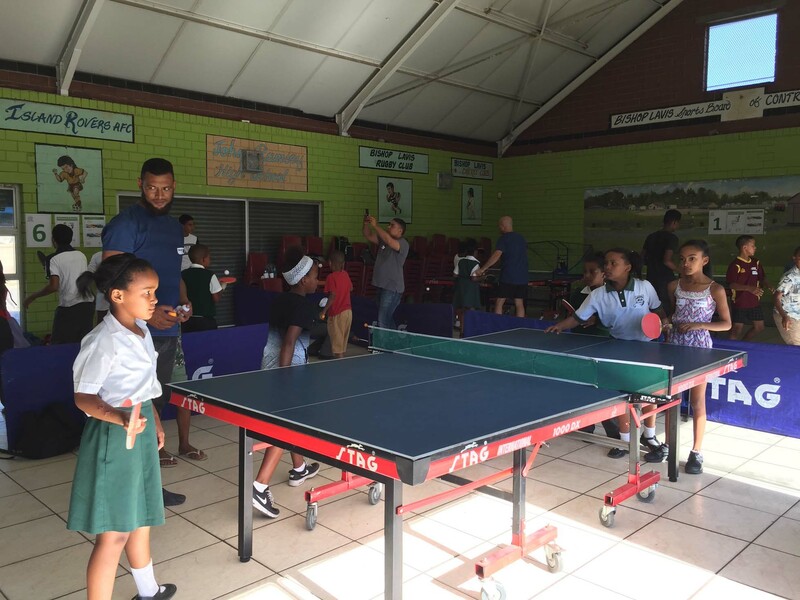 They stood fast as they challenged the robot machine, albeit with many balls flying all over the room, followed by an adapted table tennis challenge against Bishop Lavis Table Tennis Club Juniors and culminating in a BLTTC & StatPro quick doubles rounds. 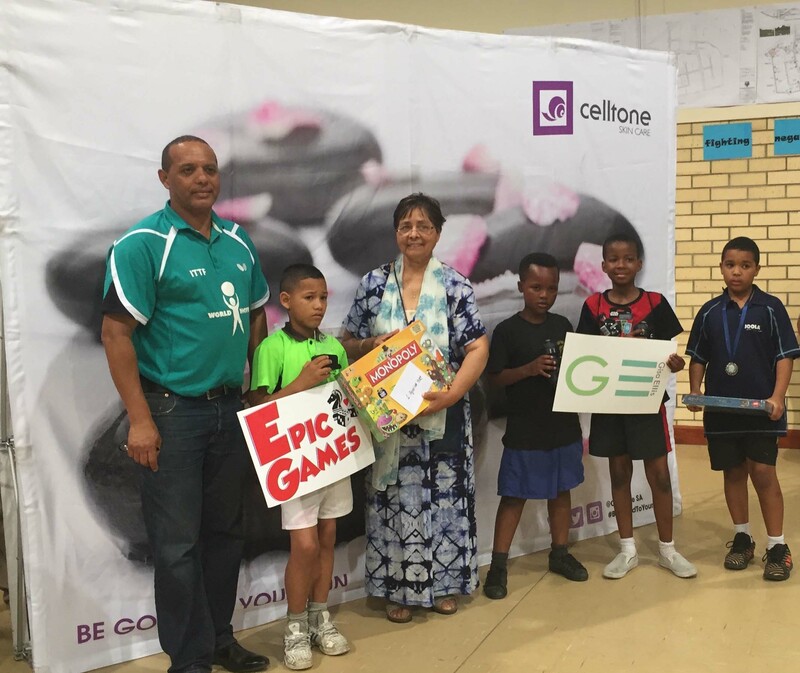 Both teams thoroughly enjoyed the experience, and our juniors were given insight into the StatPro’s business and the various employee roles within the organisation. 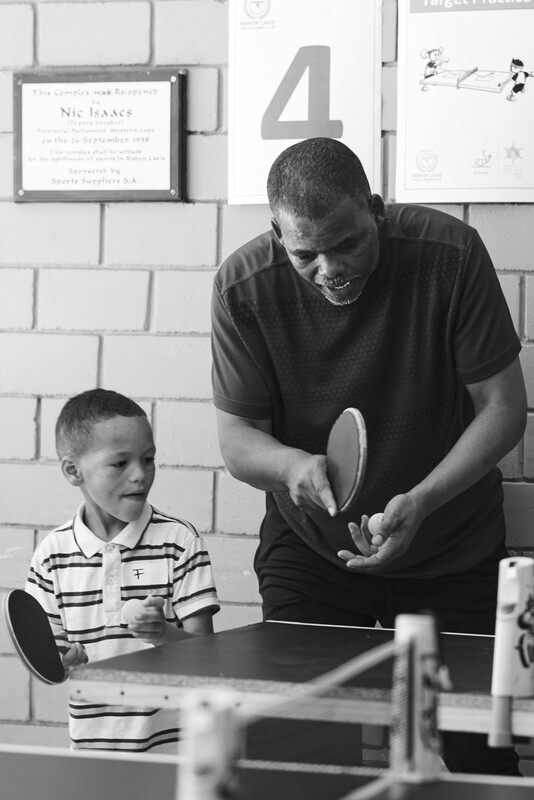 Thanks to StatPro for taking on the challenge, supporting BLTTC and giving our young people the chance to learn and develop their knowledge and skills. 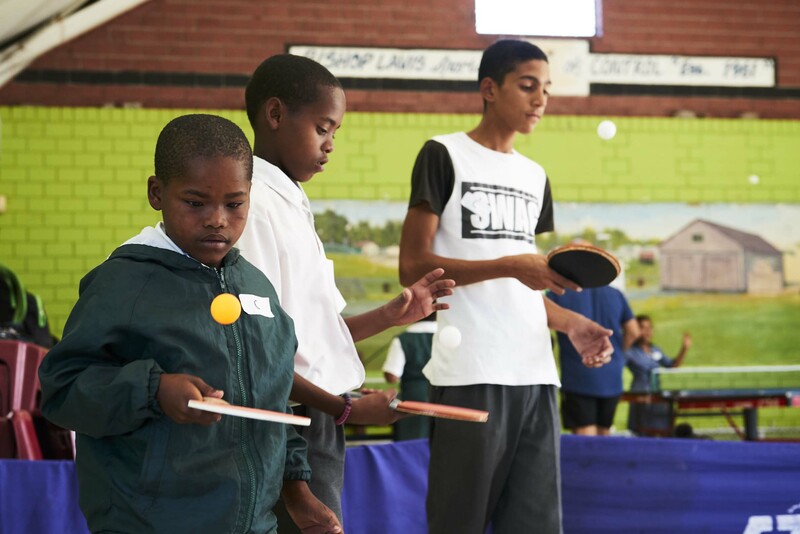 We hope to see you again in 2019 for a bigger and better round two!! 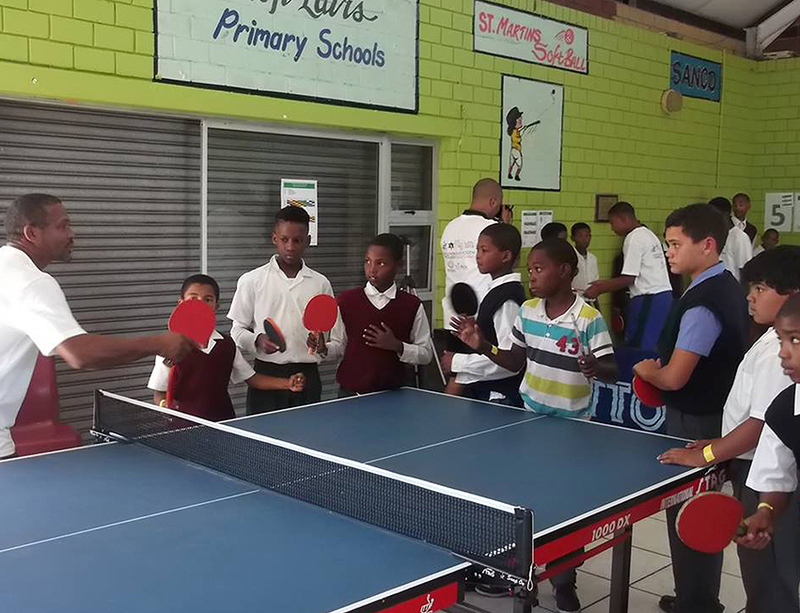 The Bishop Lavis Table Tennis Club 2018 Junior Open Singles Tournament held at Montivideo Primary School was a fantastic success and a great time was had by all. 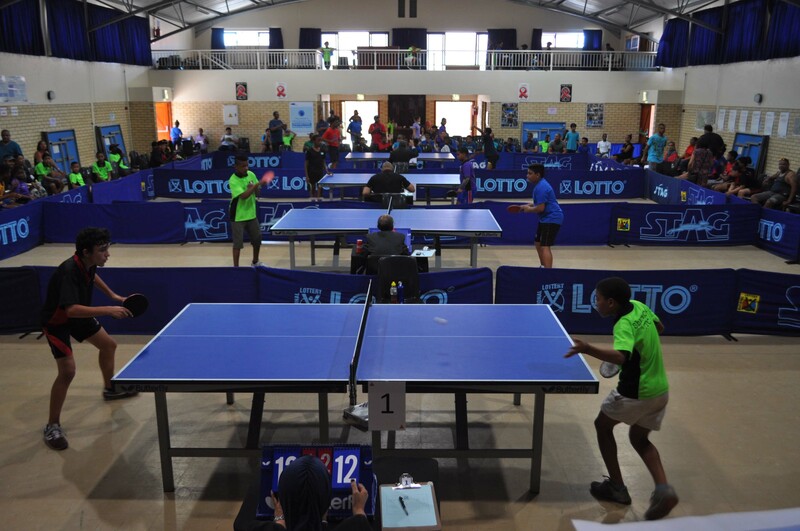 Over 120 juniors participated in the boys and girls events ranging from beginners to our National Players in the following categories; U/11, U/13, U/15, U,18 and U/21. 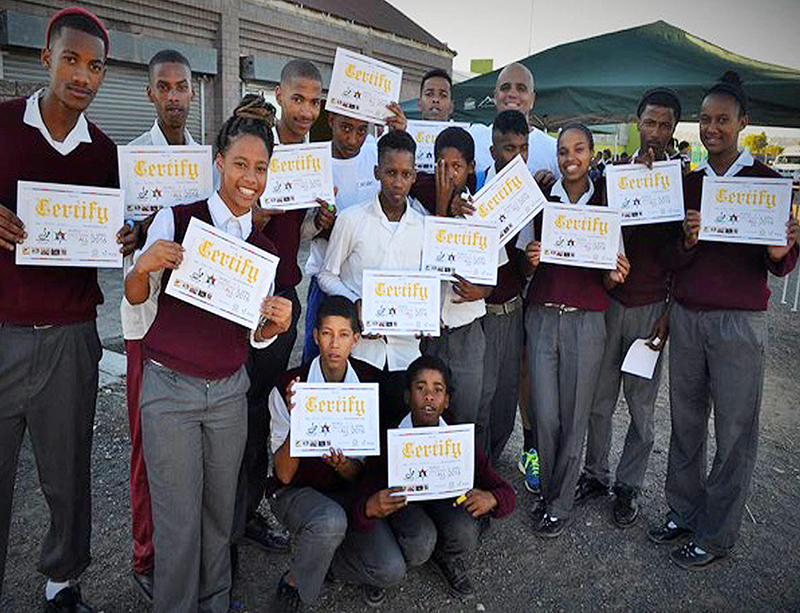 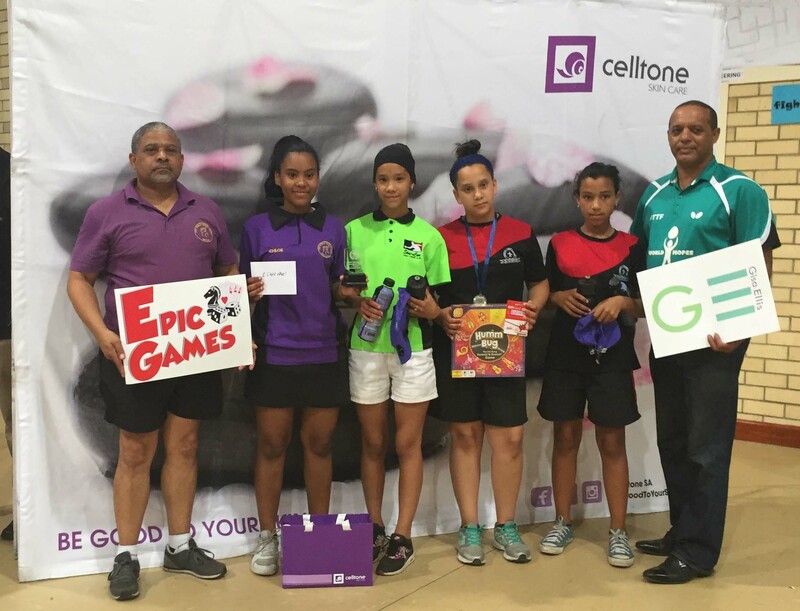 ShareCon club won most medals taking 4 golds, Top table Tennis Club clinched 2 golds and Bishop Lavis also took home 2 gold medals. 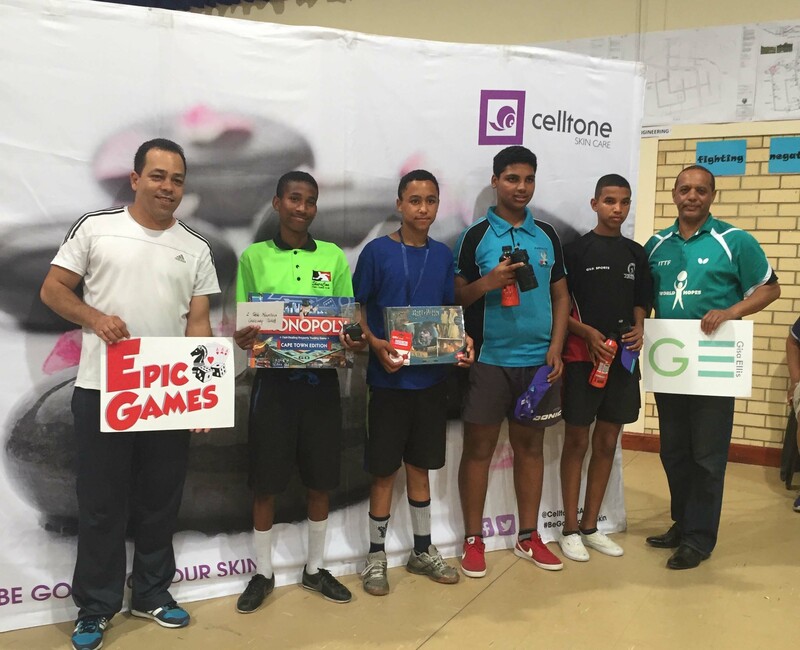 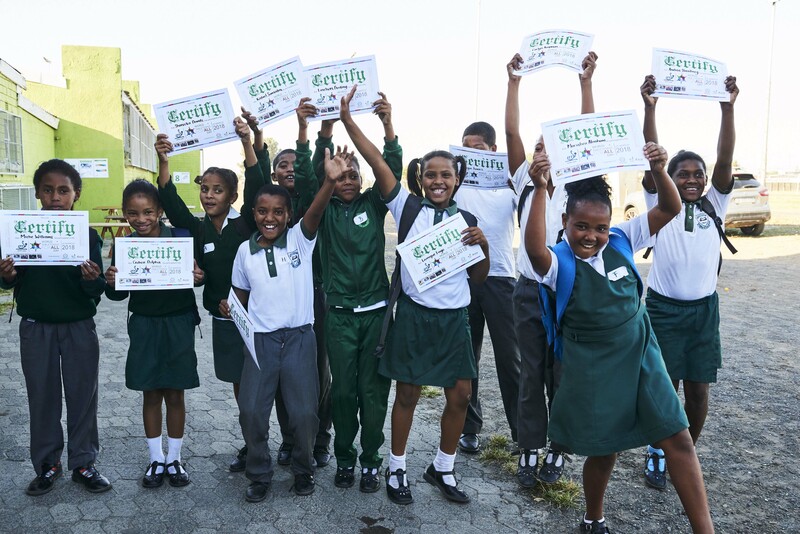 Congratulations to all who participated from the players to the supporting parents and all who provided support to pull the event together A HUGE Thanks to Celltone, Gisa Ellis, and Epic Games, Cape Wheel, The Aquarium, Table Mountain Cable Way and Acrobranch for all the amazing prizes. 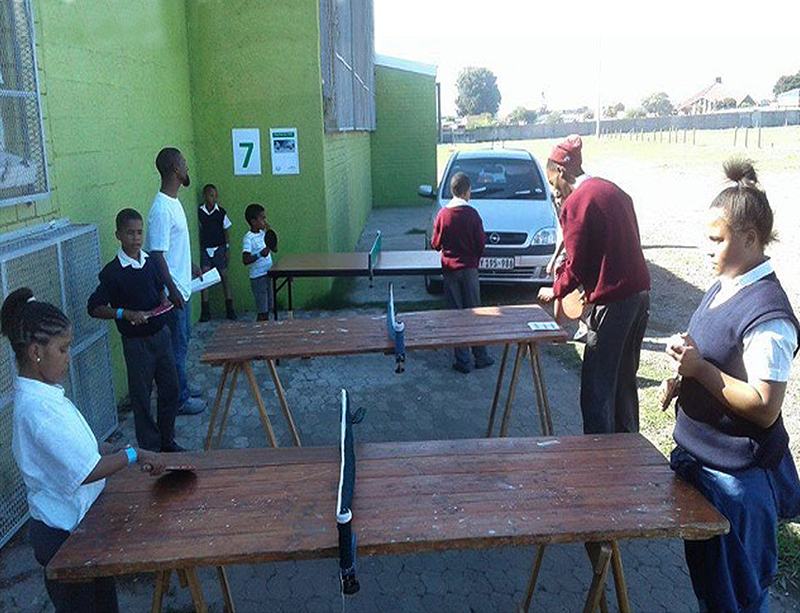 Also thanks to Grant Thomashoff for proving the hand sanitiser for the goodie bags which each participant received. 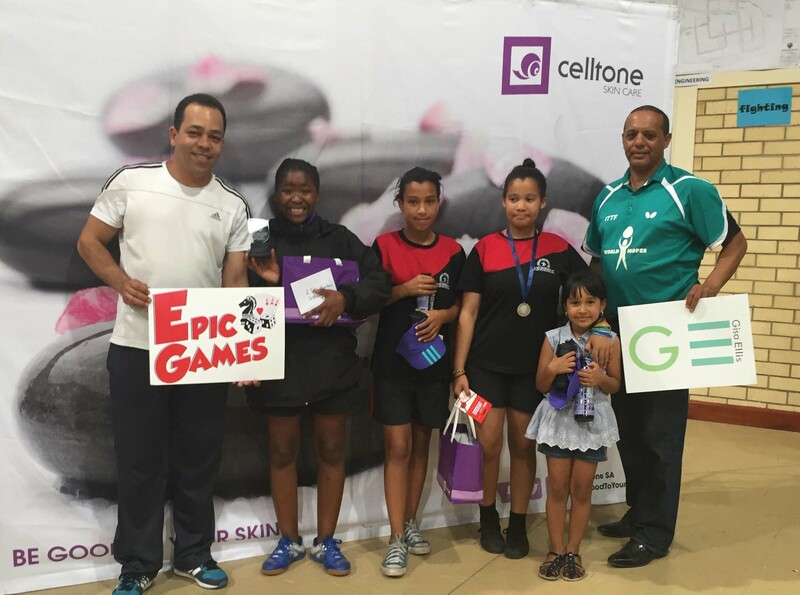 Thank You everyone for making our first tournament in 12 years such a great one! 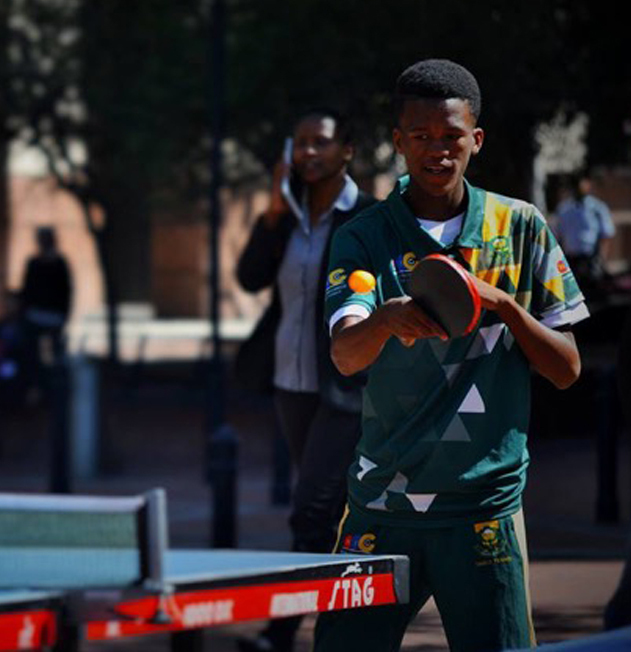 Congratulations to our National Players; Cade Peters and Darren Wyngaardt for clinching Gold and Silver respectively at the SA Open Junior Men’s National Championships. 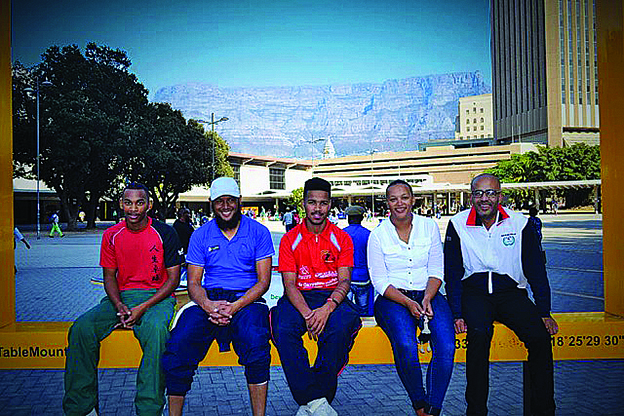 Double congratulations to Cade and Darren for securing Gold in the Junior Men’s Doubles, and a final round of applause to Cade for also taking the Mixed Doubles with partner Musfiquh Kalam who also hails from Cape Town. 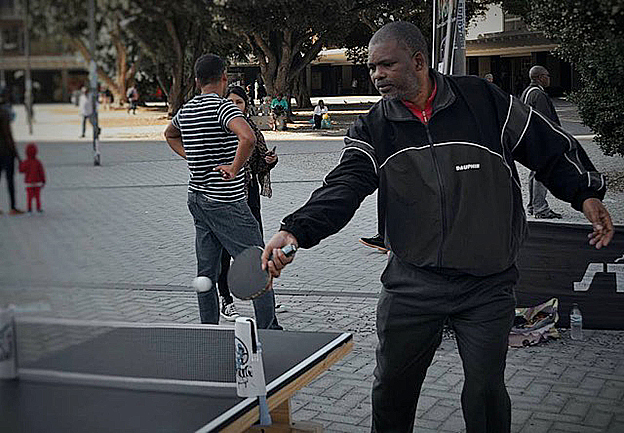 Hats off also to Shane Overmeyer for collecting Silver in the Men's Championships. 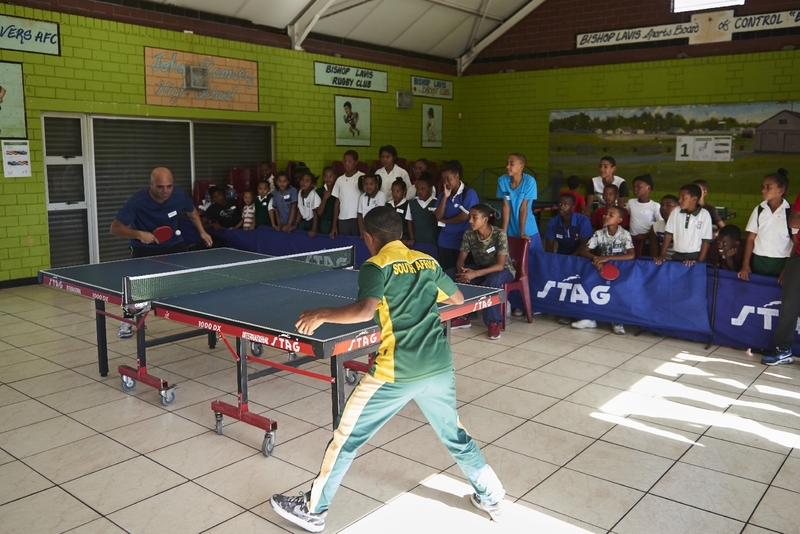 Our Juniors and Future Champs. 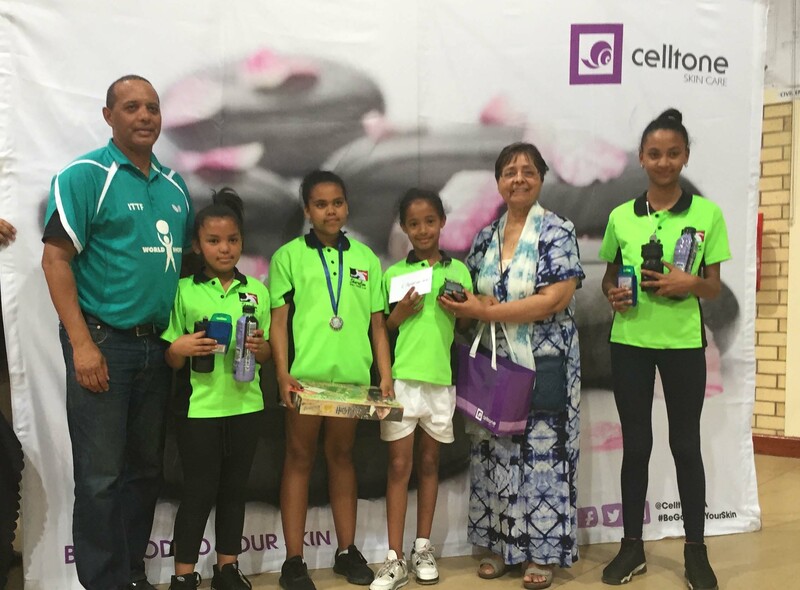 Our beginner juniors who joined the table tennis club in March 2018 after attending the BLTTC open day proudly recieveing their Bronze Table Tennis Achievement Certificates and water bottles (donated by Adidas). 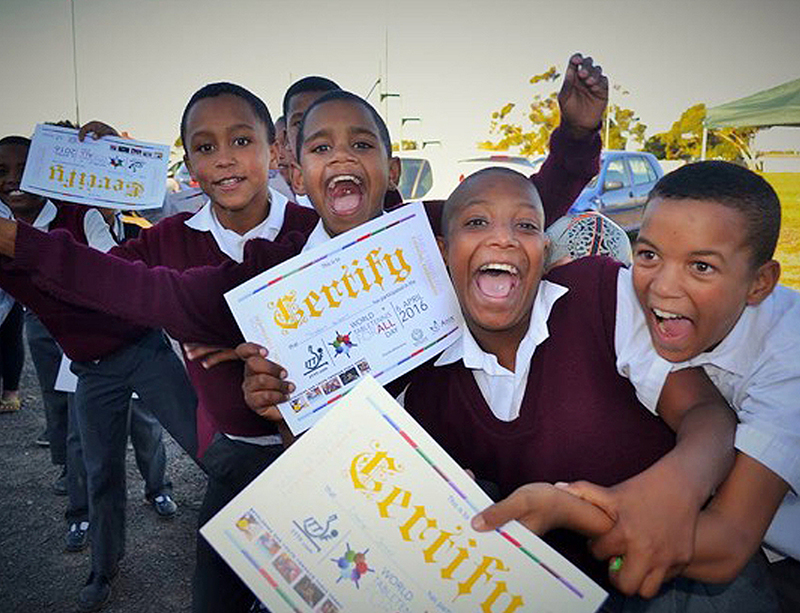 Well done team - we are proud of you all. 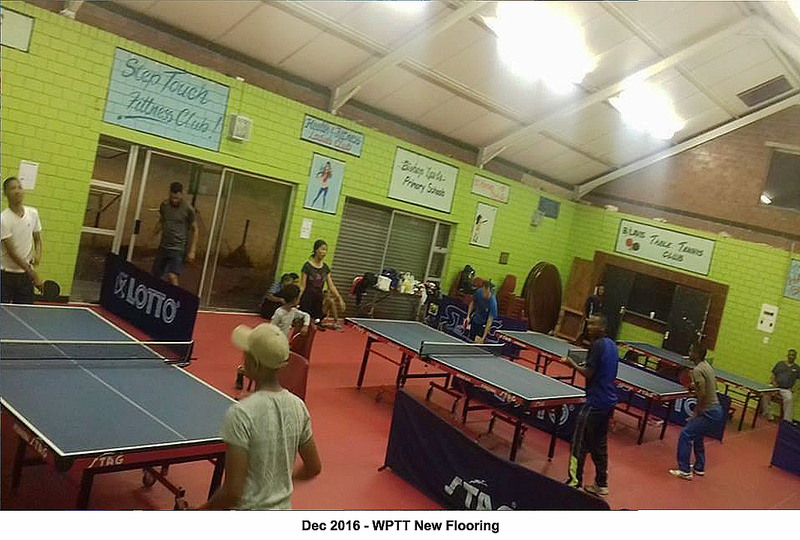 Bishop Lavis Wins the WPTT Club of the Year Award - 2017! 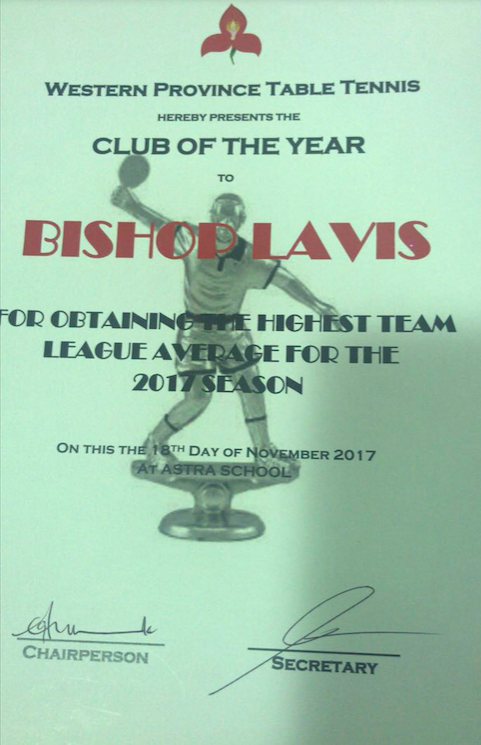 Congratulations and Thanks to all our club members for their commitment and dedication to their game and our club. 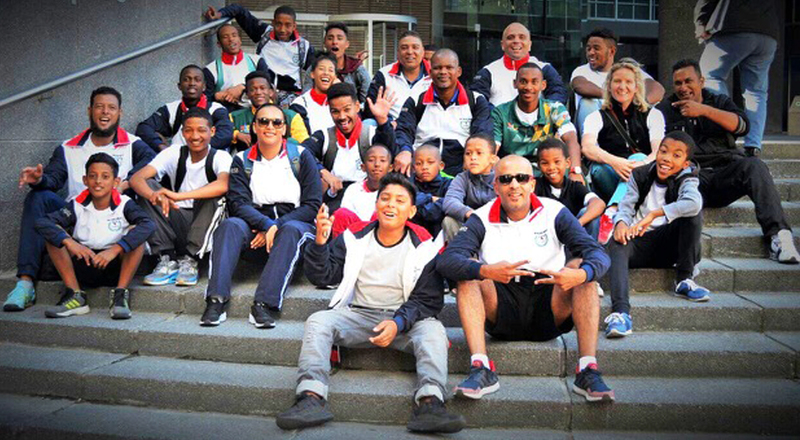 May our success continue and our club thrive and grow. 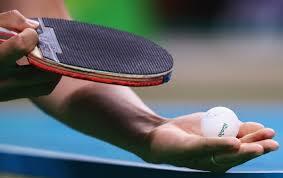 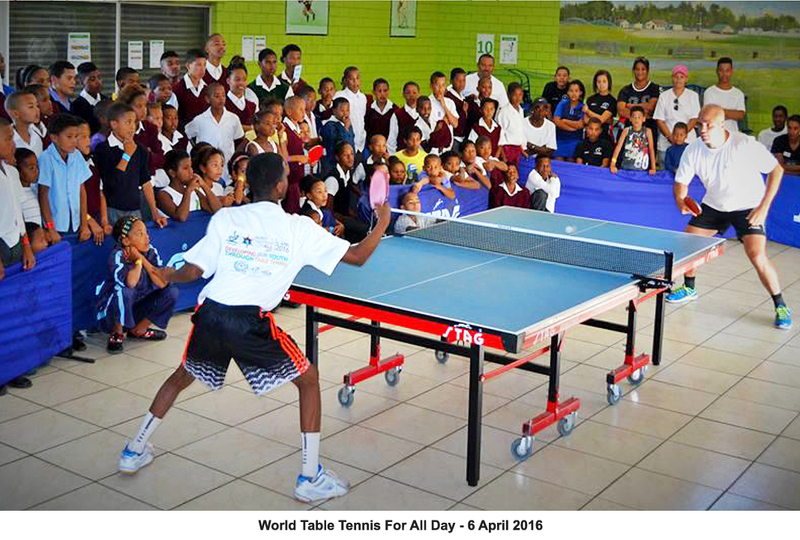 Congratulation to all who participated in the Western Province Table Tennis Open. 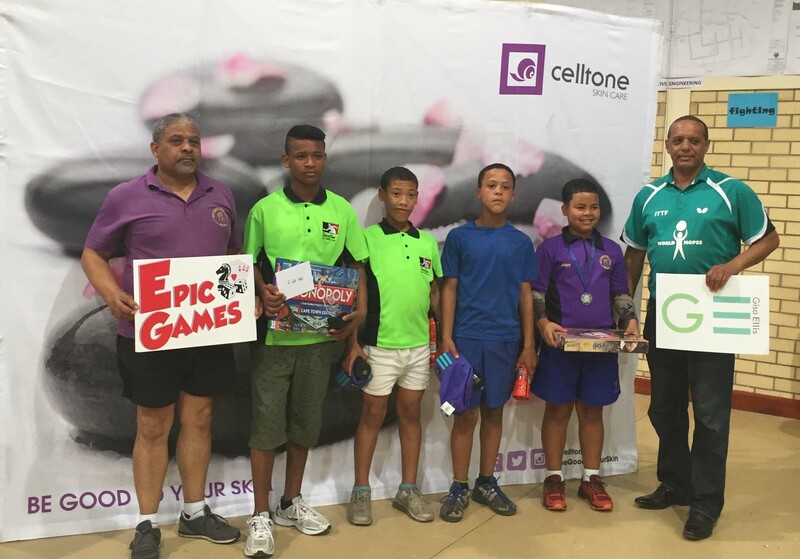 The club walked away with a few trophies to add to the growing collection from both old and new players. 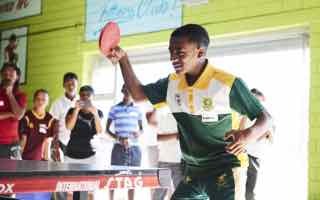 Huge congratulations to Jarmain Titus who participated in his first ever tournament and won the U13 boys title. 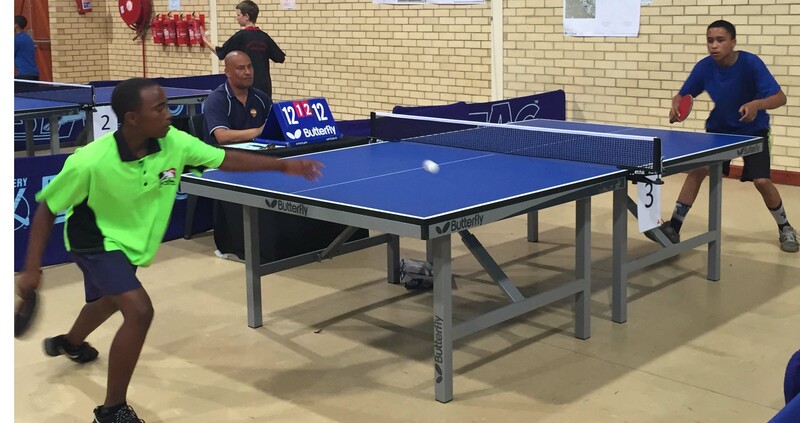 Jarmain joined BLTTC after attending the clubs 'World Table Tennis for All Event' on 6th April 2016 and here he is 20 months later winning trophies! 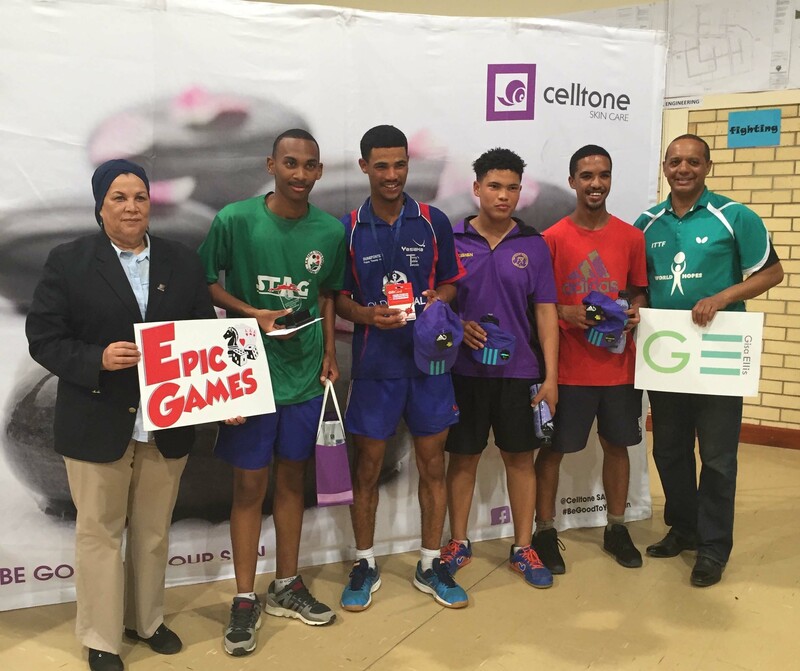 Congratulations also to; Cade Peters for clinching the U18 Male Championship and Chesray Boysen for claiming 2nd place, Byrone Abrahams for taking 2nd in the Men's Finals and finally to the 3rd League Team; Rhiyaan, Thabiet and Chisum for winning the WPTT Third League Tournament and the Knockout Challenge. 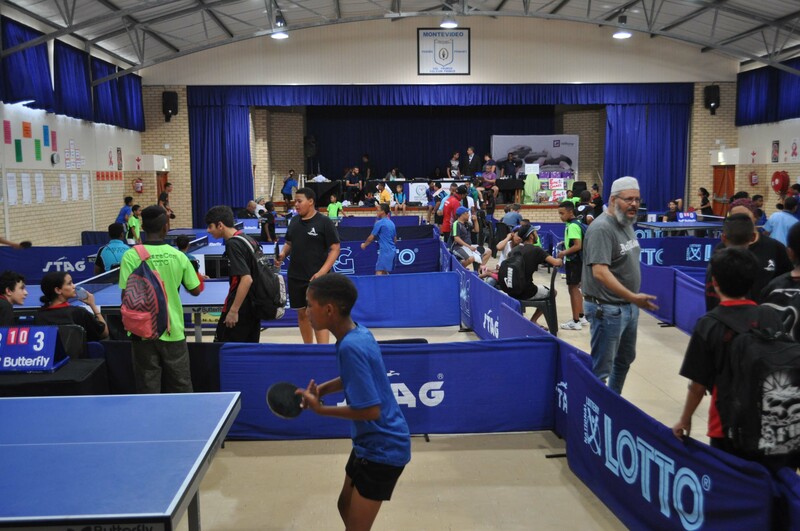 A successfull year had by all - watch this space for bigger and better action from the club in 2018. 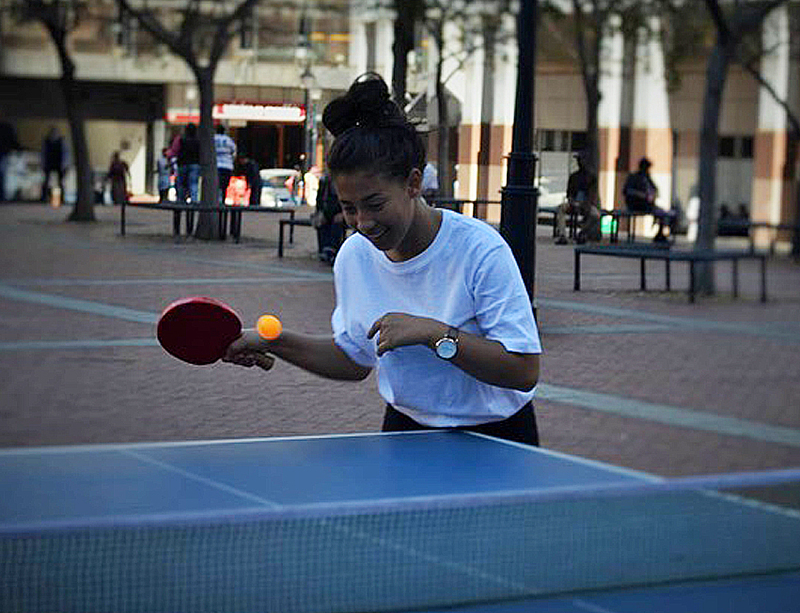 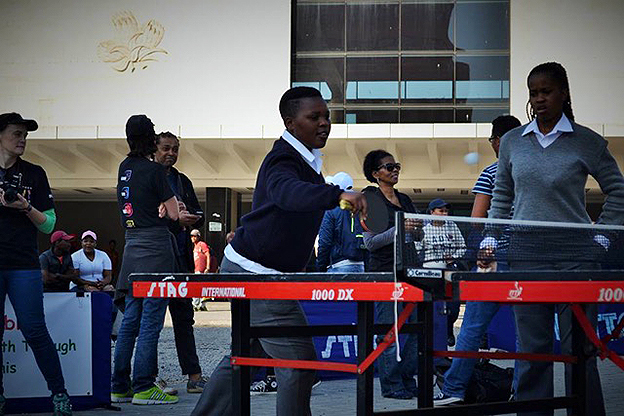 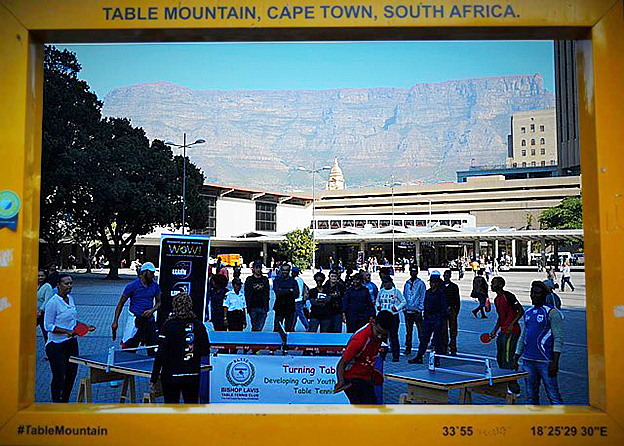 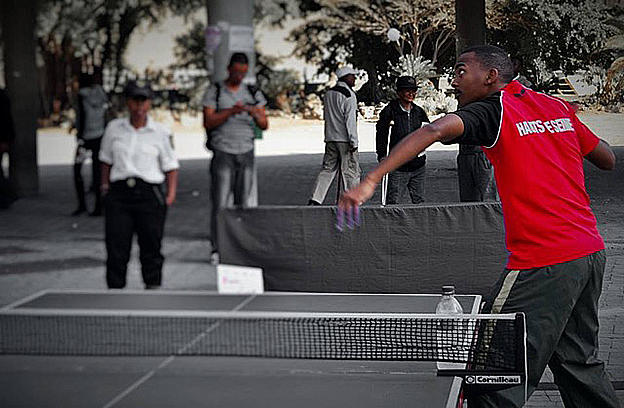 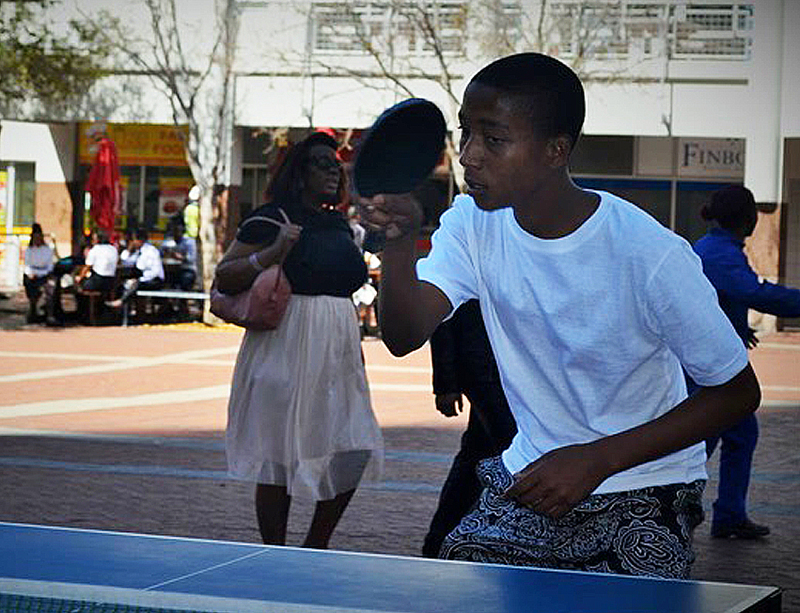 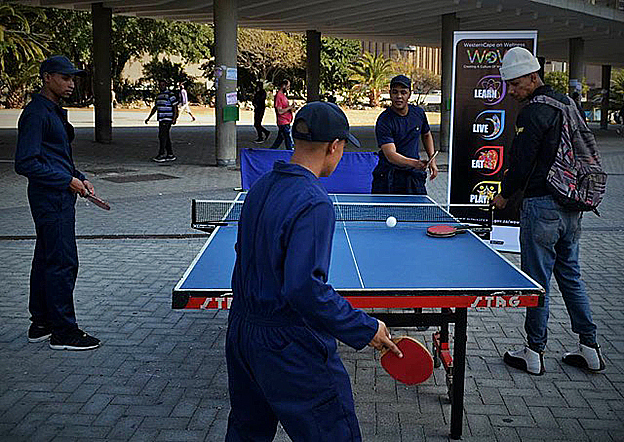 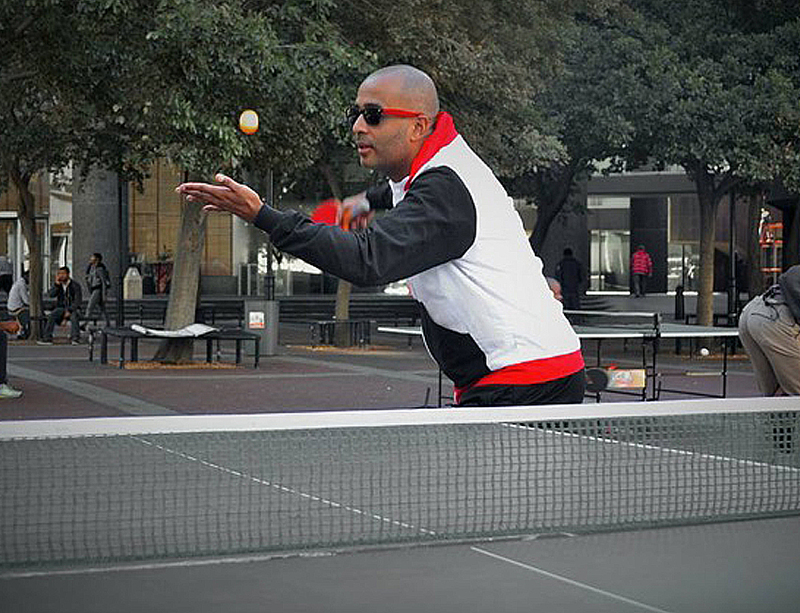 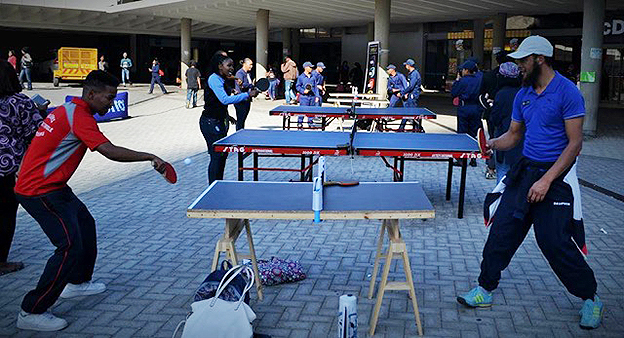 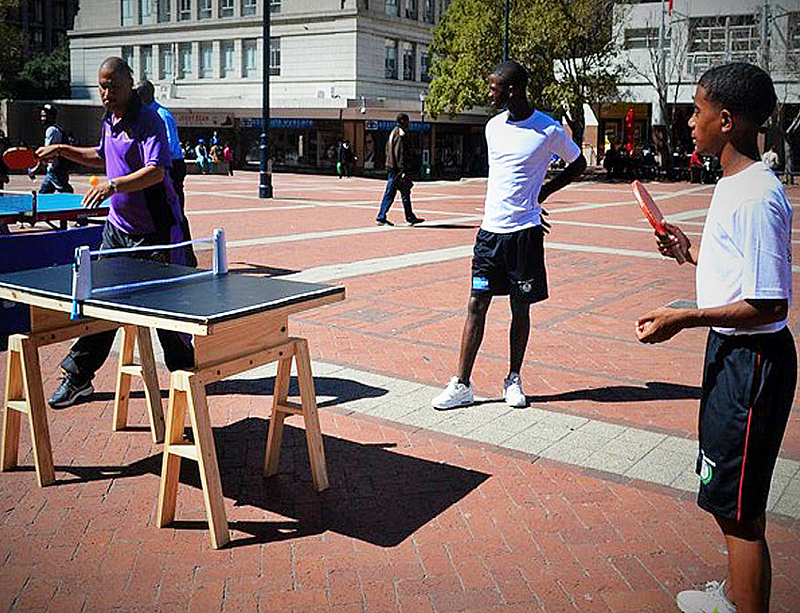 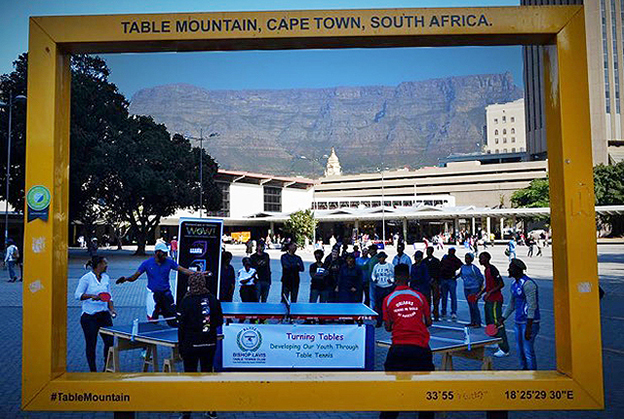 Bishop Lavis Table Tennis Club celebrated World Table Tennis Day with an open air exhibition across 3 locations in the Cape Town CBD in order to promote and spread the word of table tennis. 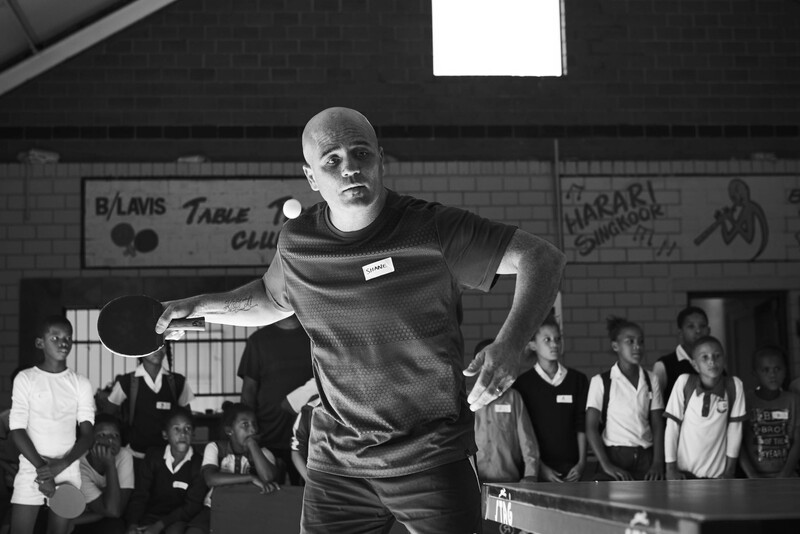 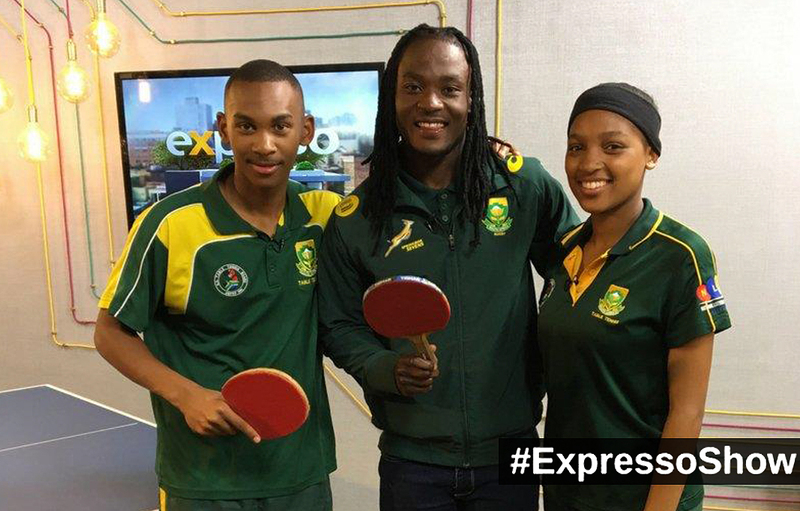 The general public got a rare opportunity to take on South Africa’s 8 times table tennis champion Shane Overmeyer and current junior champion Byrone Abrahams. 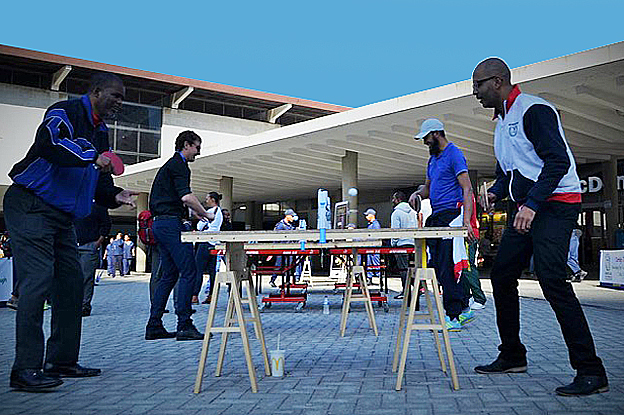 Players from complete beginners to seasoned players played on mini tables as well as full size tables, received some coaching tips and enjoyed the spirit of the game with our club members. 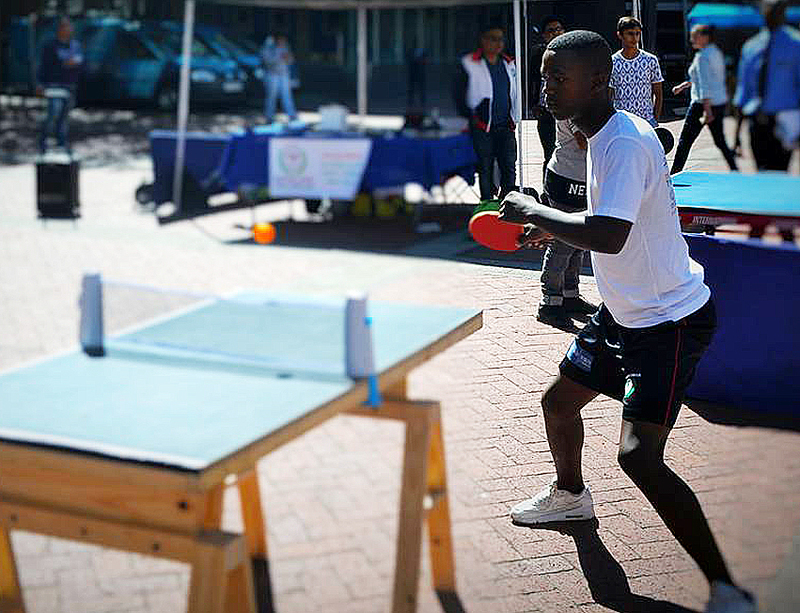 World Table Tennis Day is a celebration of the joy to play Table Tennis for fun, bringing people together where the focus is less on the competition and more on participation and fun. 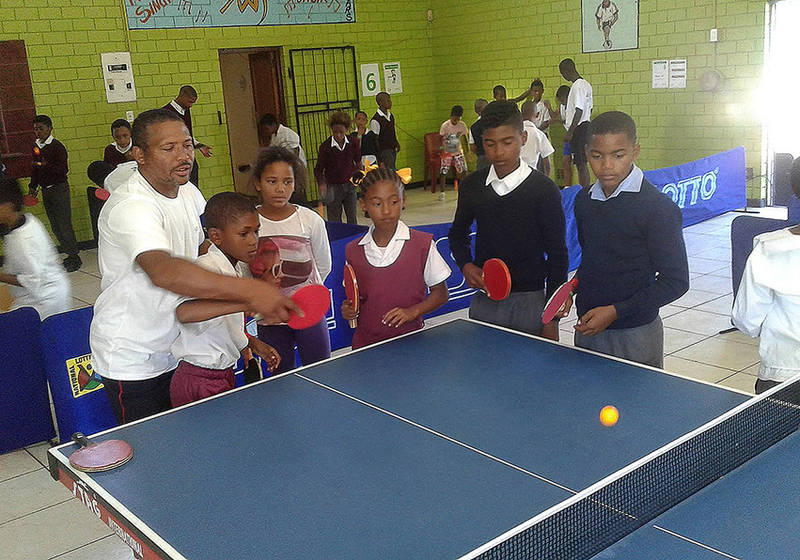 On 31st May 2017 Bishop Lavis Table Tennis Club once again joined up with Western Cape on Wellness WoW! 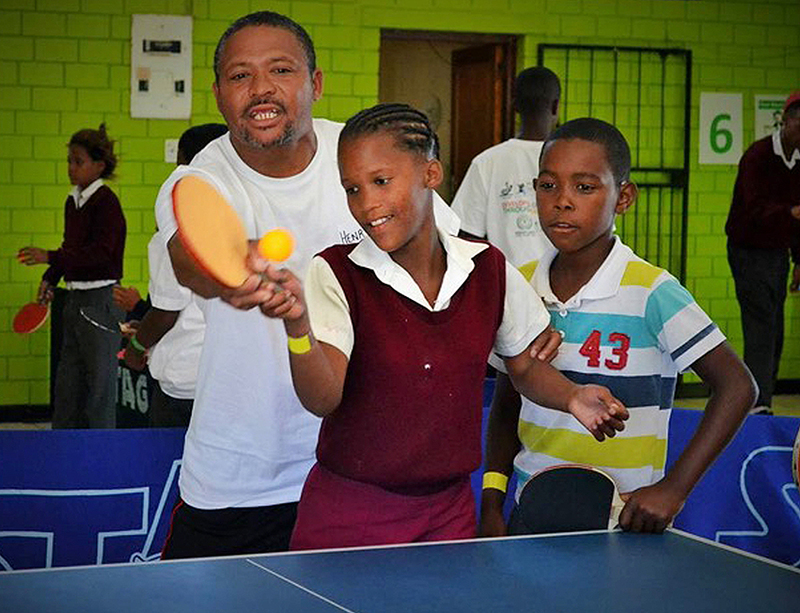 to help promote active health lifestyles. 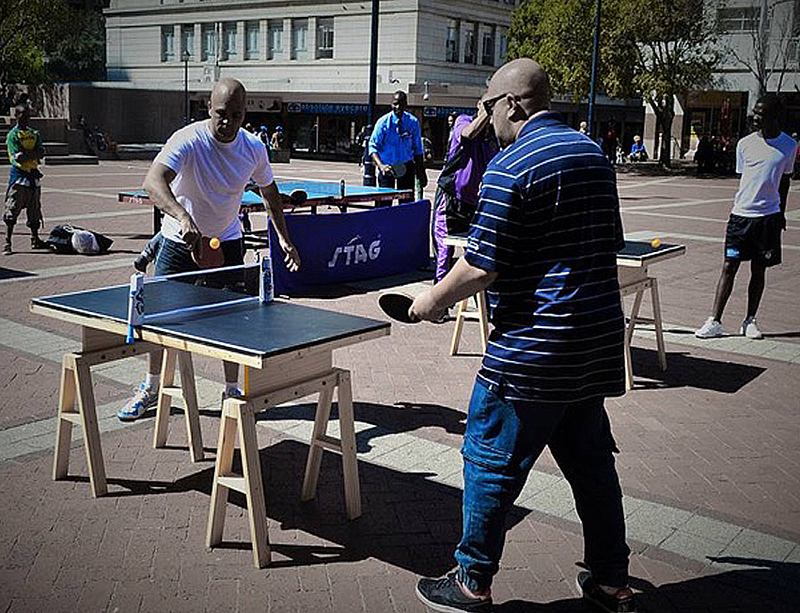 Table Tennis Tables were set up in the forecourt of Cape Town train station, the music was rocking and passer-by danced and ping ponged till their hearts were content! 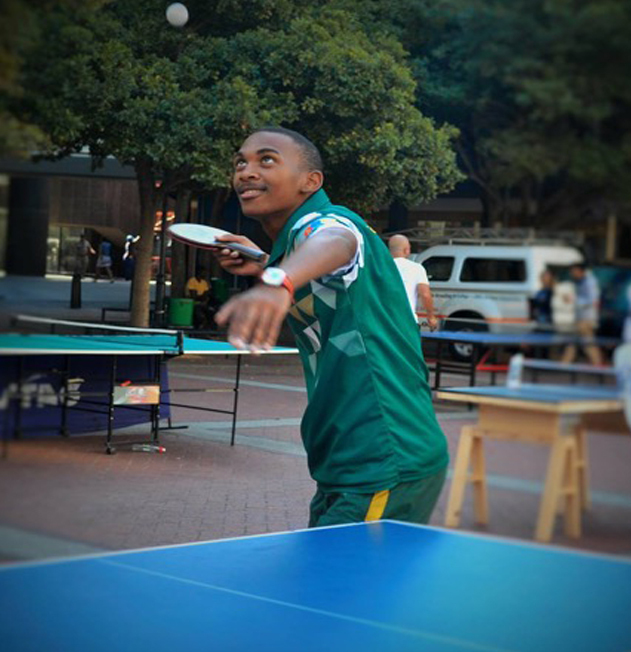 On the 19th April reigning Junior Table Tennis Champion and Bishop Lavis TTC member Byrone Abrahams left for month training in France hosted by Ping Sans Frontiers (PSF) and Levallois Table Tennis Club. 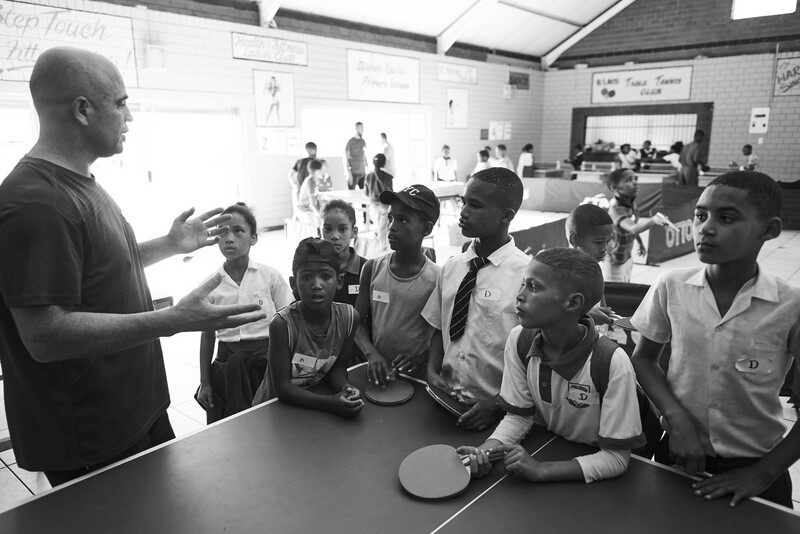 In addition to the personal and cultural experience, Byrones program comprised everyday training with the senior French National team and personal talks with the national team coaches. 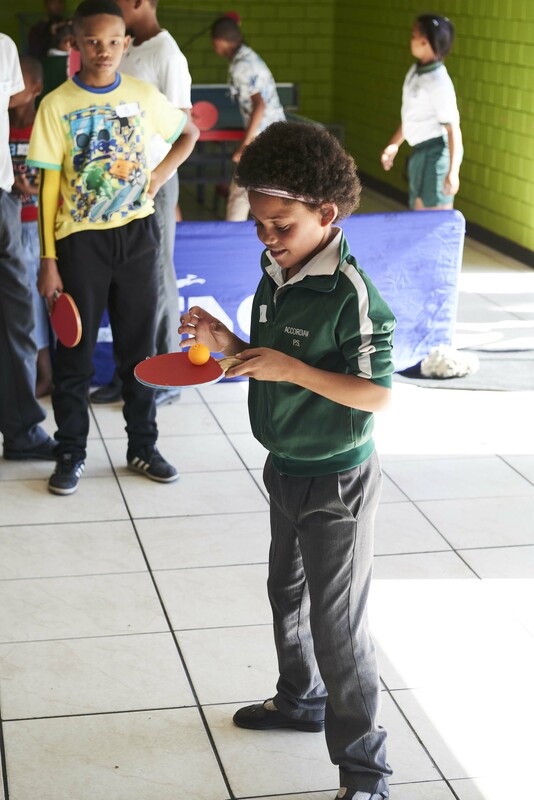 Byrones new skills and technique have made quite a difference to his game and confidence and we look forward to Byrone growing success in his own game and coaching our juniors. 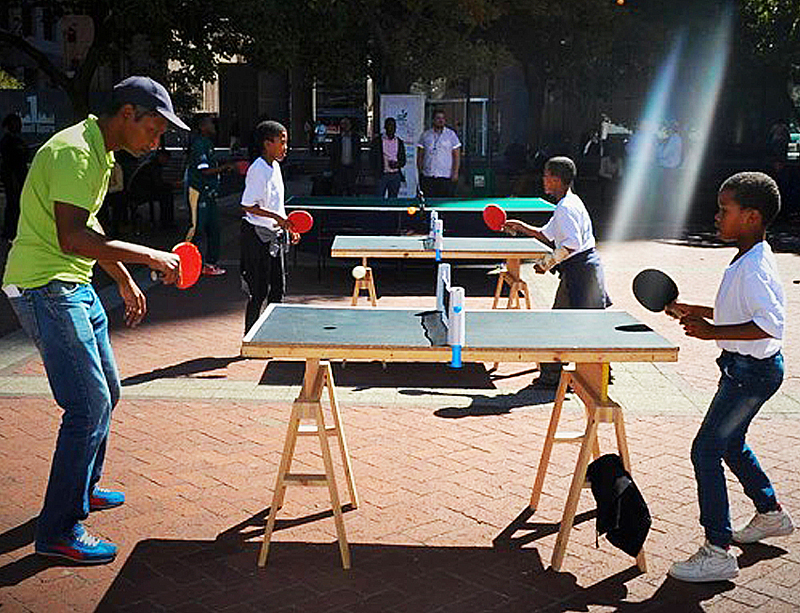 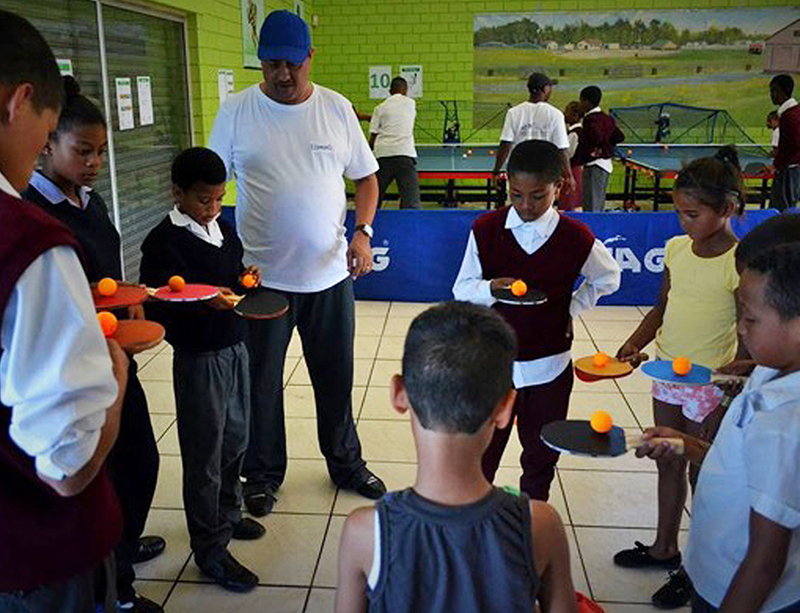 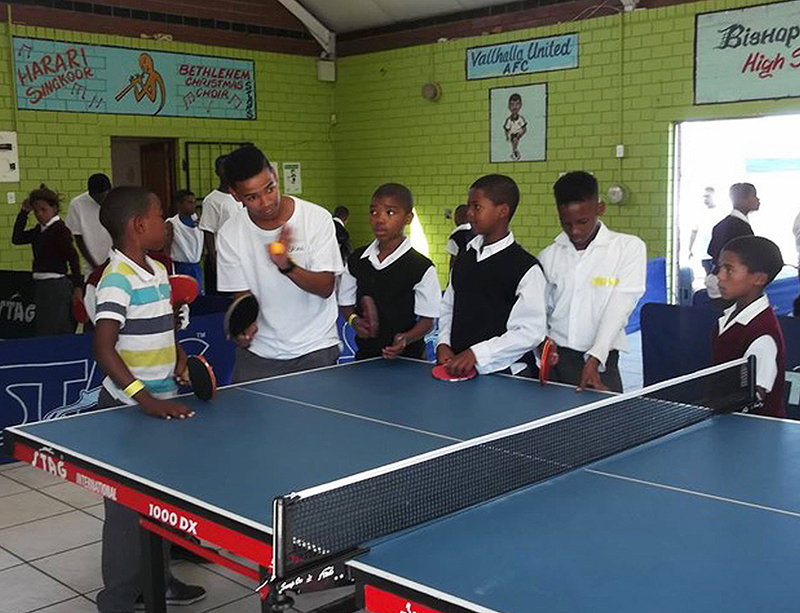 Bishop Lavis Table Tennis Club joined the WoW Wellness Hub at Open Streets Mitchells Plain to help get people active and promote the game of table tennis. 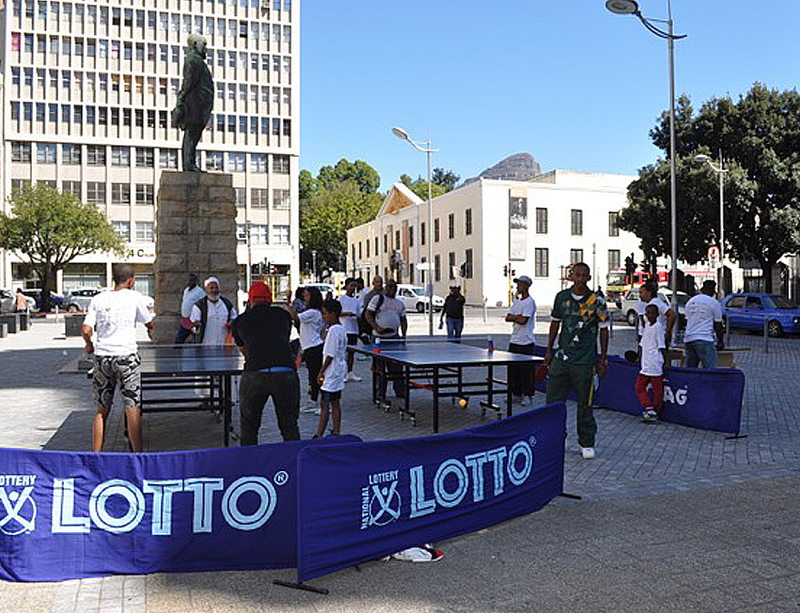 Open Streets participants of all age and ability were able test their skills and spins against South Africa 8 times champion Shane Overmeyer. 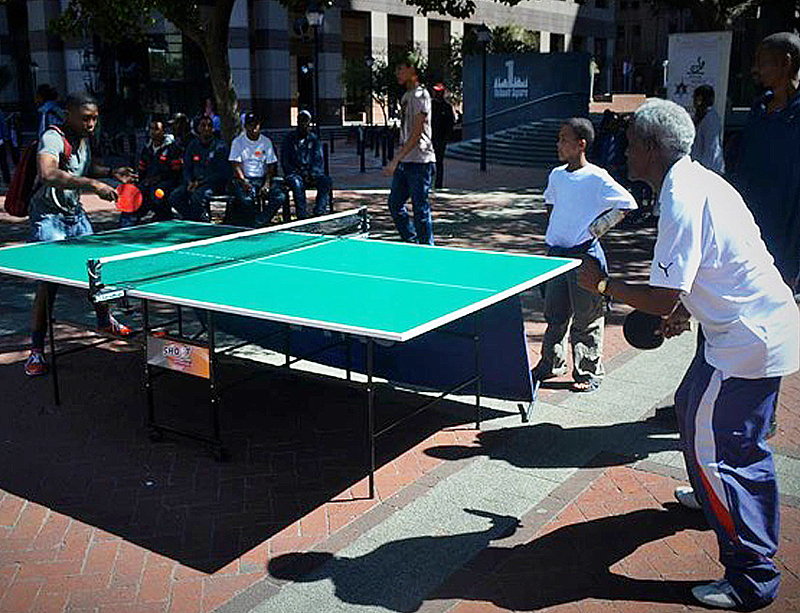 South African junior players Byrone Abrahams and Cade Peters were also on site to give passers-by a challenge. 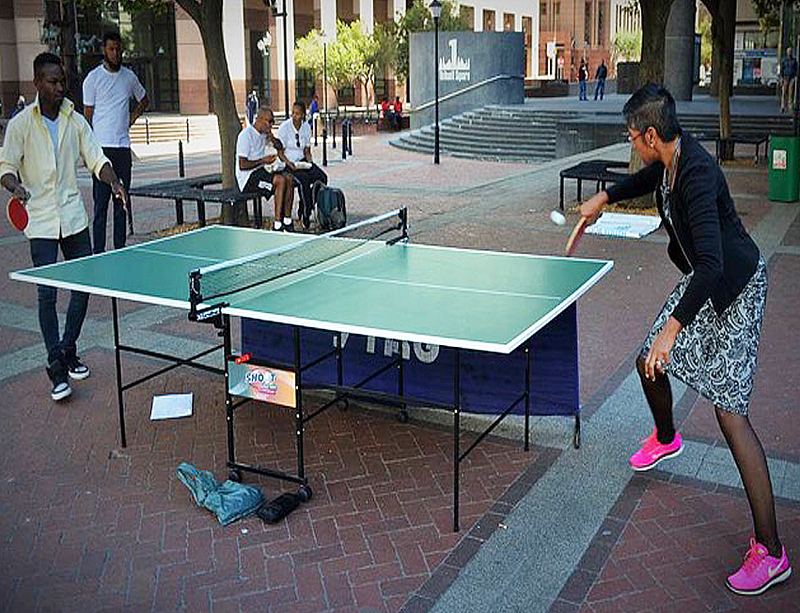 In the end it was the wind that won the game as participants found themselves playing air tennis rather than table tennis. 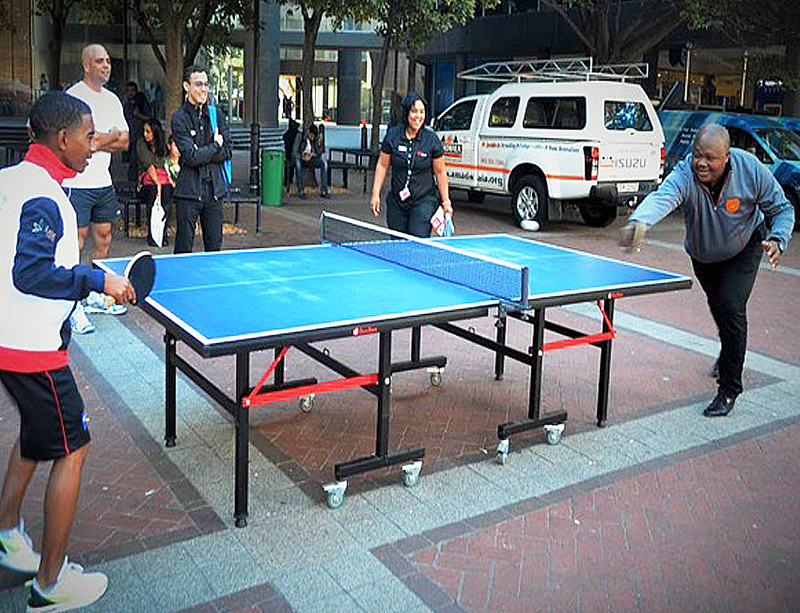 Either way fun and games were had by all. 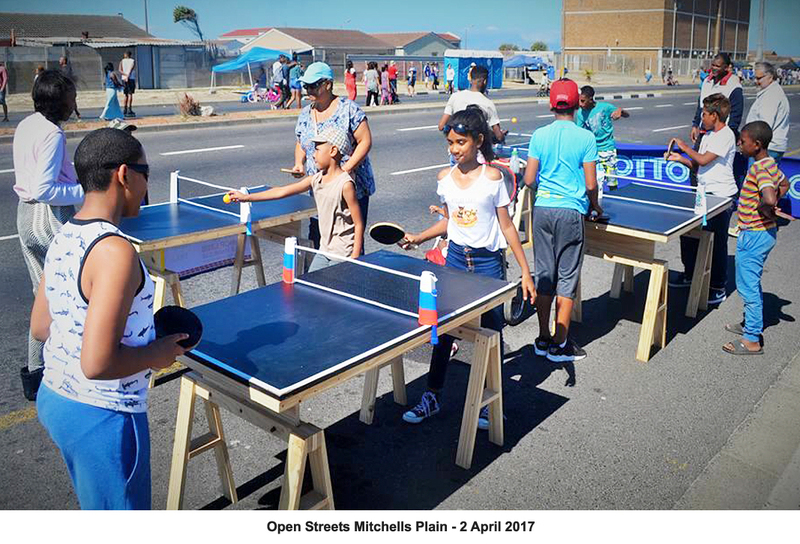 Open Streets comprises the closing of streets to motorised transport to create a platform for community building and healthy recreational activity. 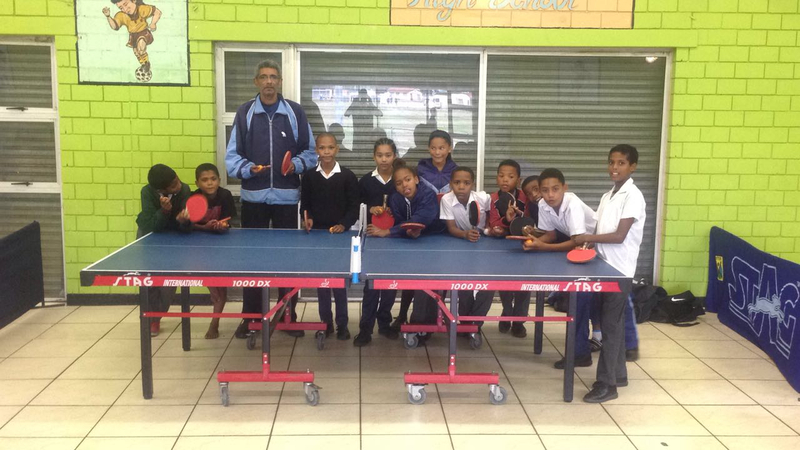 As a result of our achievements to date WPTT Executive Chairperson Mr Kelvin Smith donated the sports flooring used at the World Junior Table Tennis Championships in Cape Town Dec 2016 to Bishop Lavis TTC. 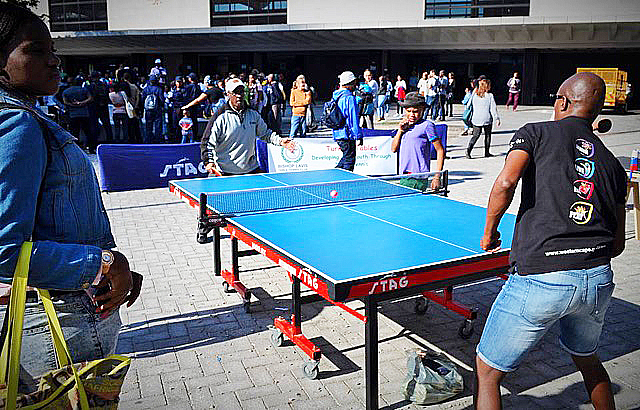 Thus enabling the club to host league matches, which otherwise wasn’t possible due to the unsuitability of the club venue floor. 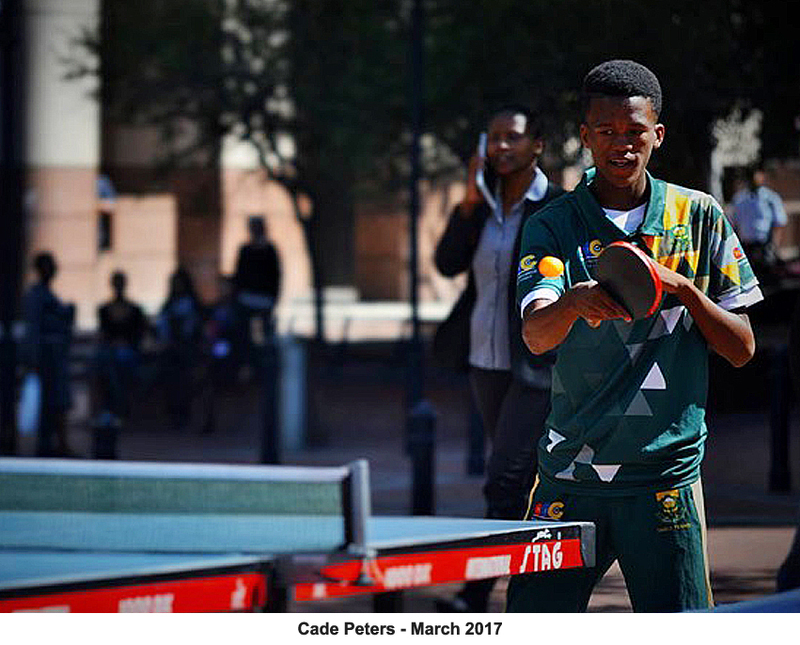 After some rigorous trials Cade Peters (BLTTC) retains his place on the SA Junior Team to play in the 2017 ITTF Arican Junior and Cadet Championships to be held in Tunis. 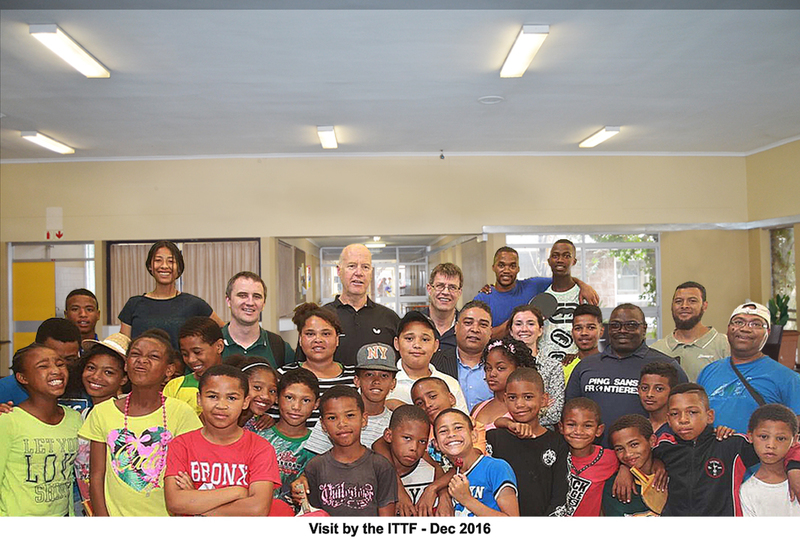 ITTF President; Thomas Weikert, Deputy CEO; Glenn Tepper and Development Co-coordinator; Michael Brown visited Bishop Lavis Table Tennis Club engaging in some fun table tennis games and activities with the clubs junior players. 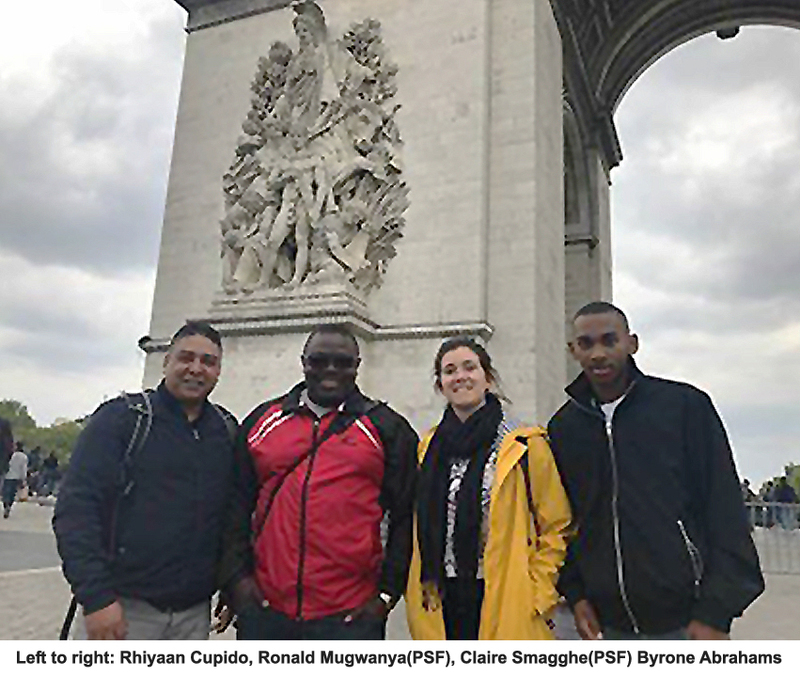 PSF Club Partners and Communication Manager Claire Smagghe; International Referee and Translator Ronald Mugwanya; arrived in South Africa for the World Junior TT Championship and to clinch the partnership between BLTTC and PSF. 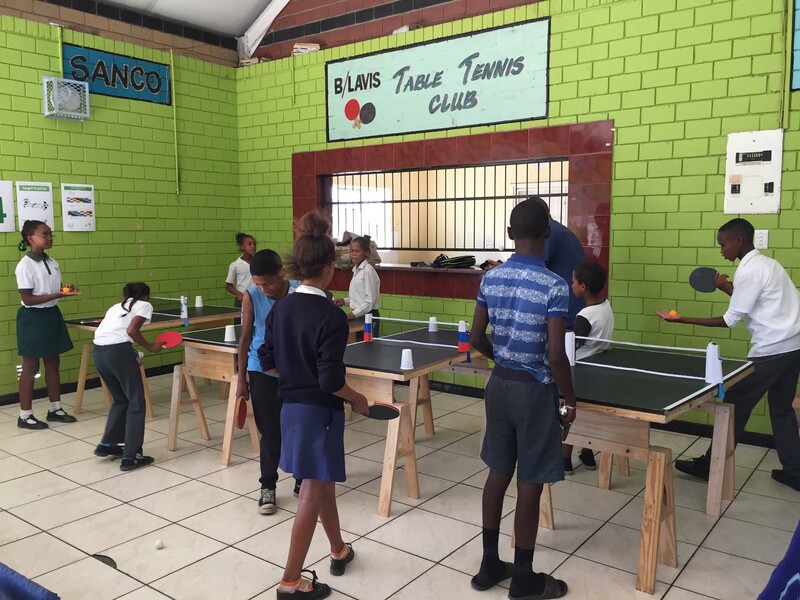 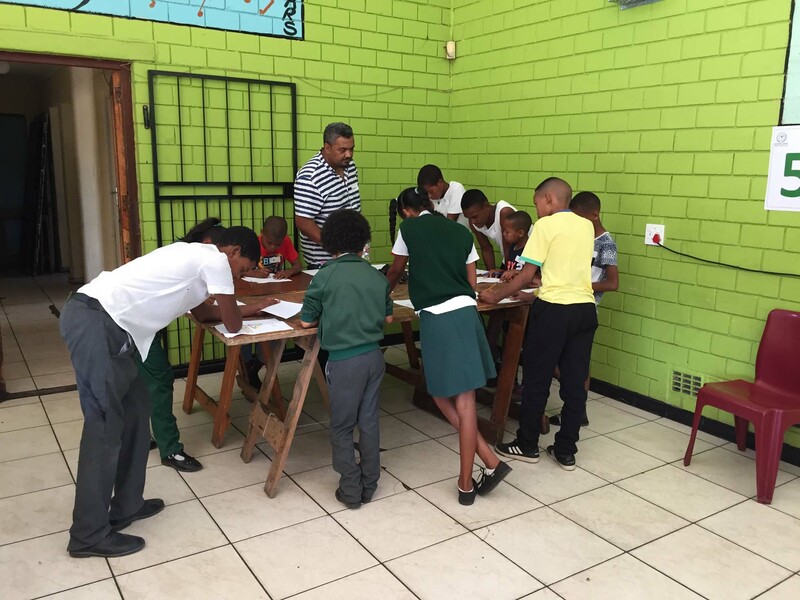 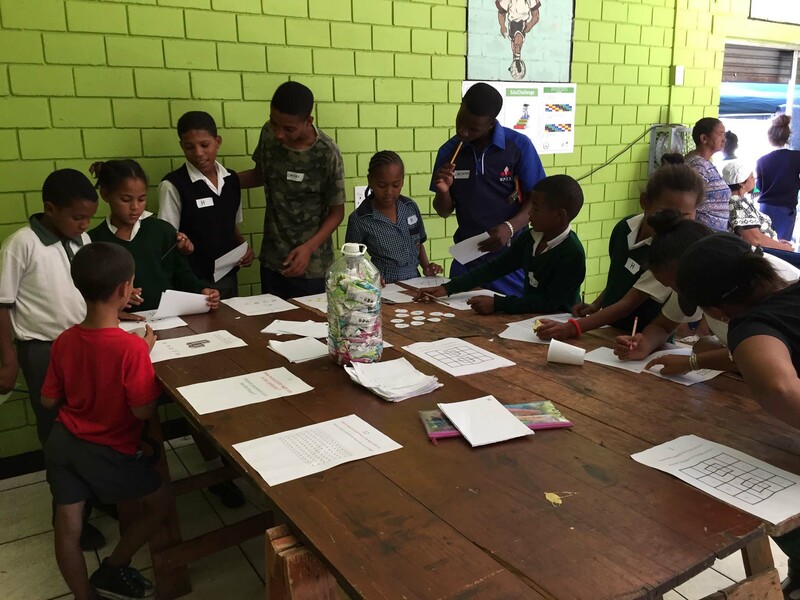 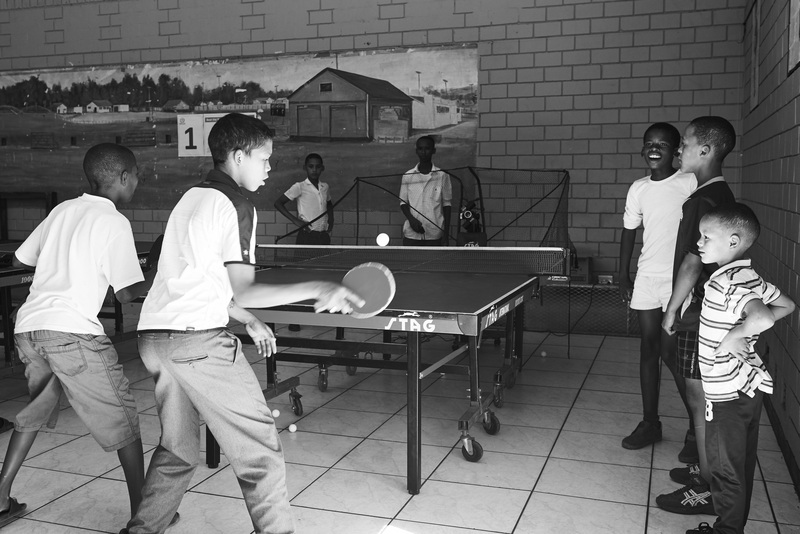 As part of the partnership agreement an outdoor table tennis table was built at BLTTC and 4 handcrafted convertible mini table tennis tables / school desks constructed which can connect together to form a full size table tennis table. 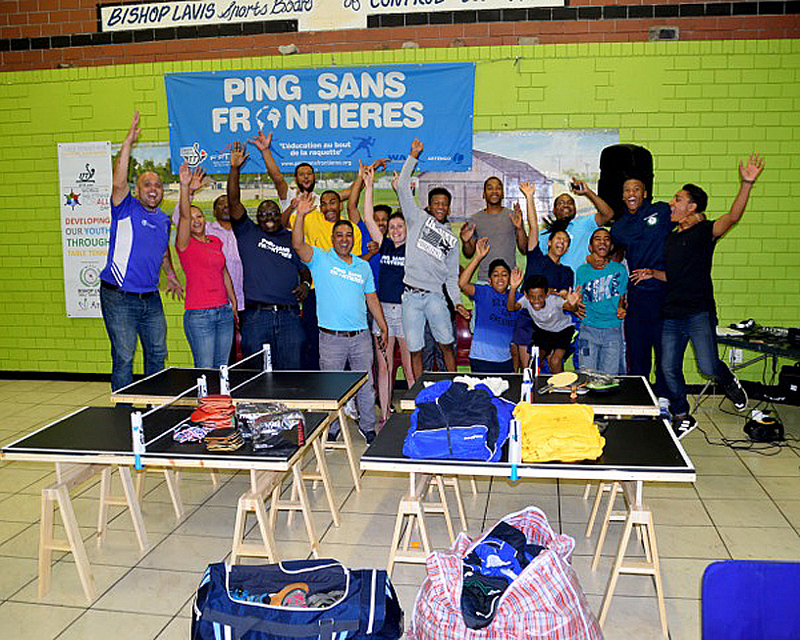 A significant amount of equipment was also donated from PSF to the club. 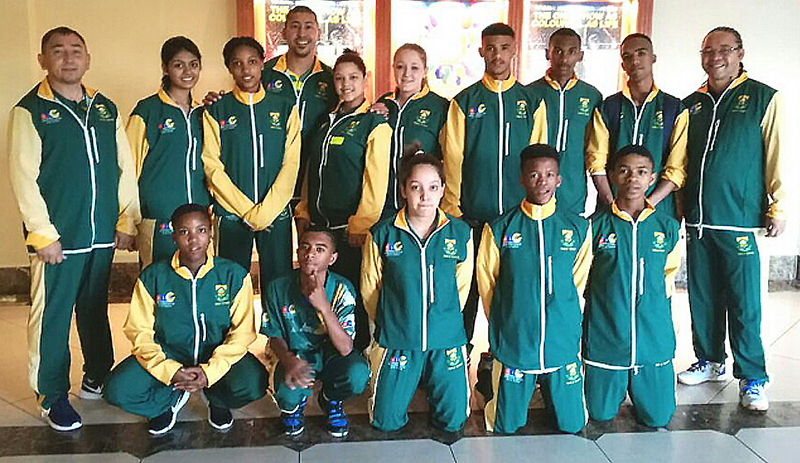 Byrone Abrahams, Cade Peters and Darren Wyngaardt fly the flag for South Africa and compete in the World Junior Championships held in Cape Town. 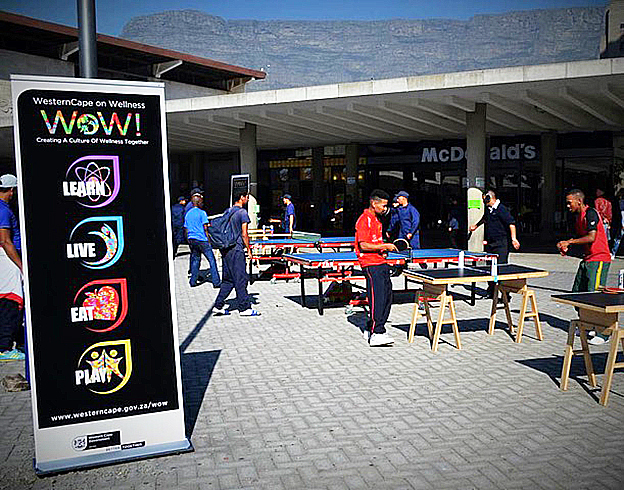 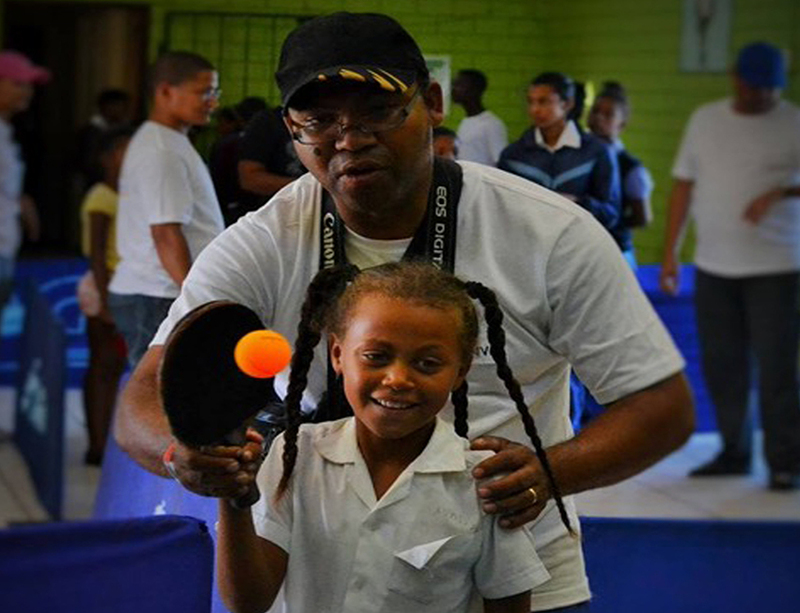 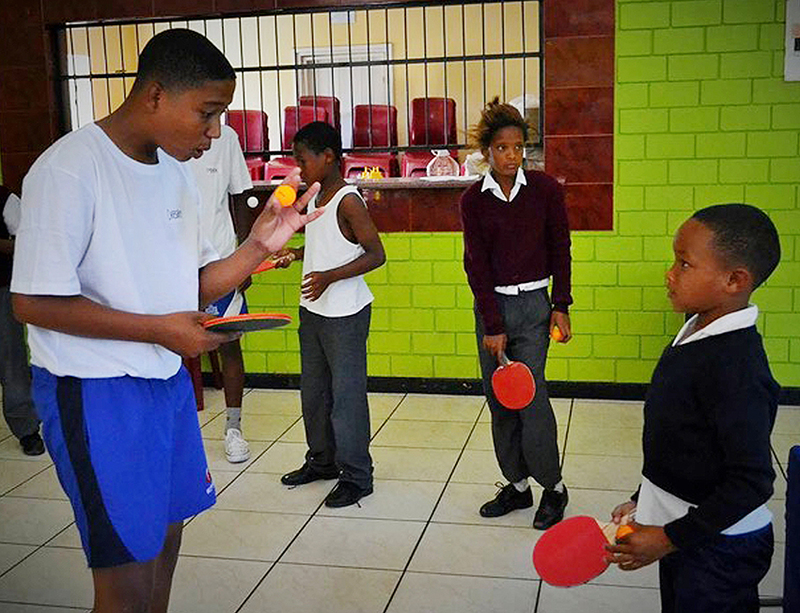 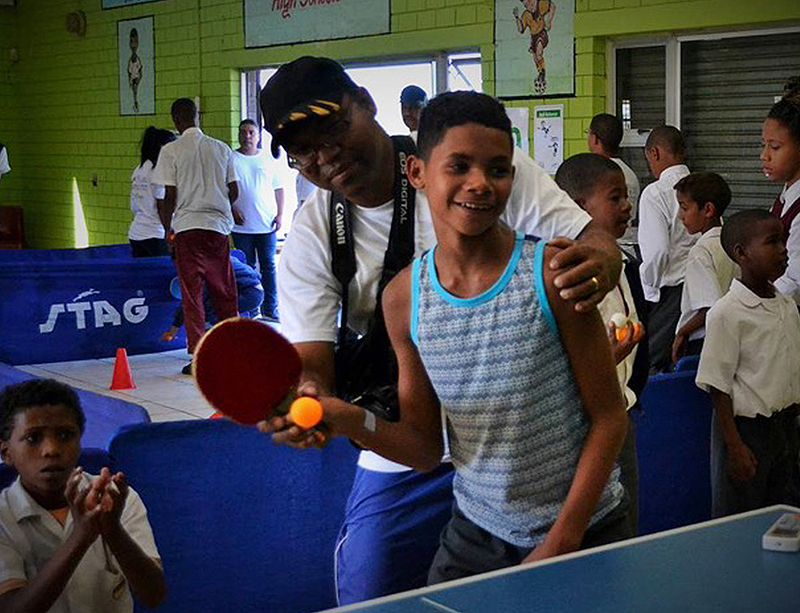 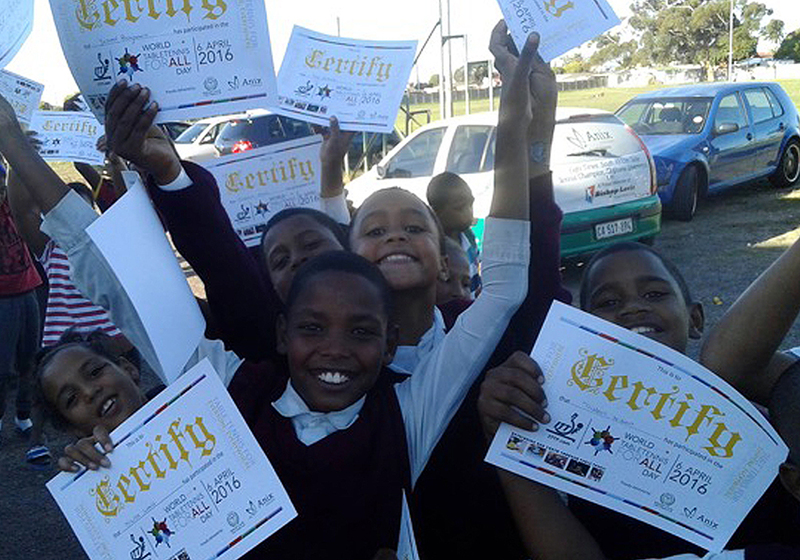 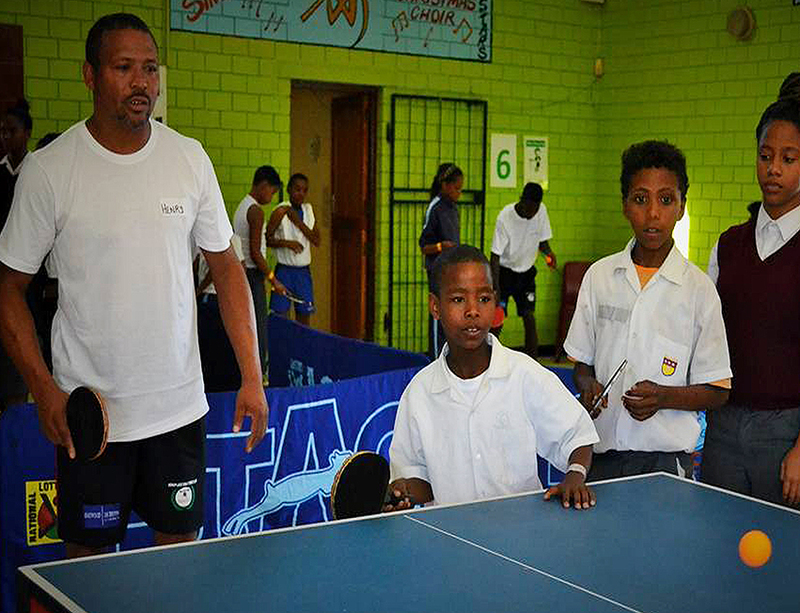 BLTTC club hosted South Africa’s inaugural World Table Tennis Day for All event. 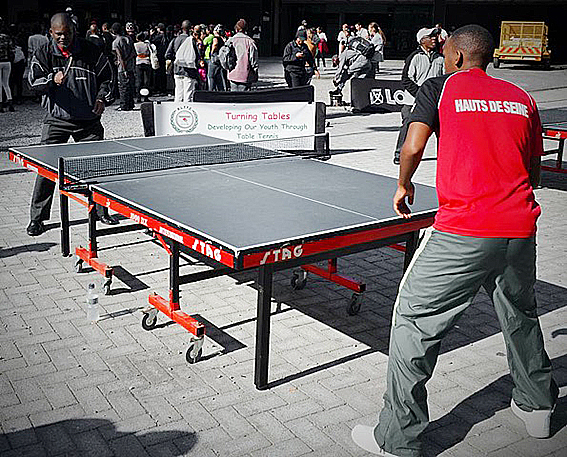 The event attracted more than 120 young people from local school, many of whom had never played table tennis before. 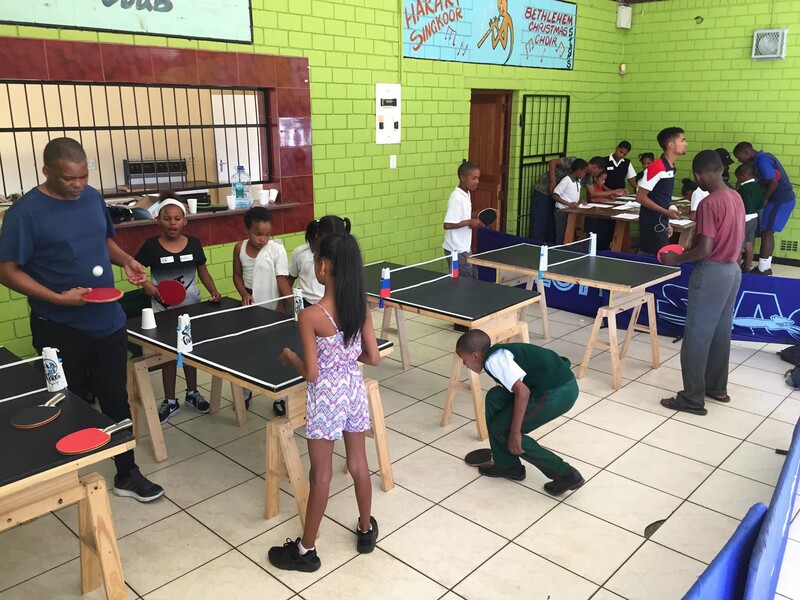 Embarking on a range of table tennis challenges from beating the robots to ping pong any table the children were soon spinning into action. 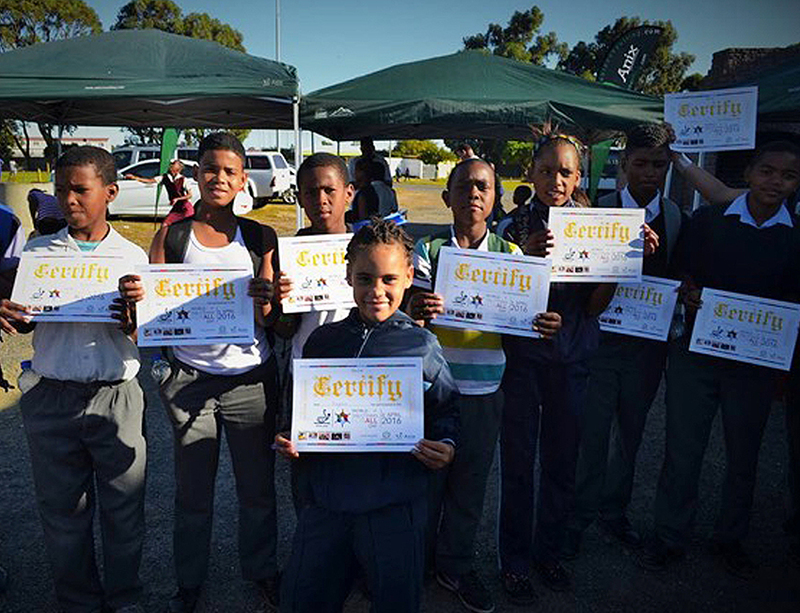 Shane Overmeyer and Cade Peters gave a demonstration game and certificates were handed out to all who participated. 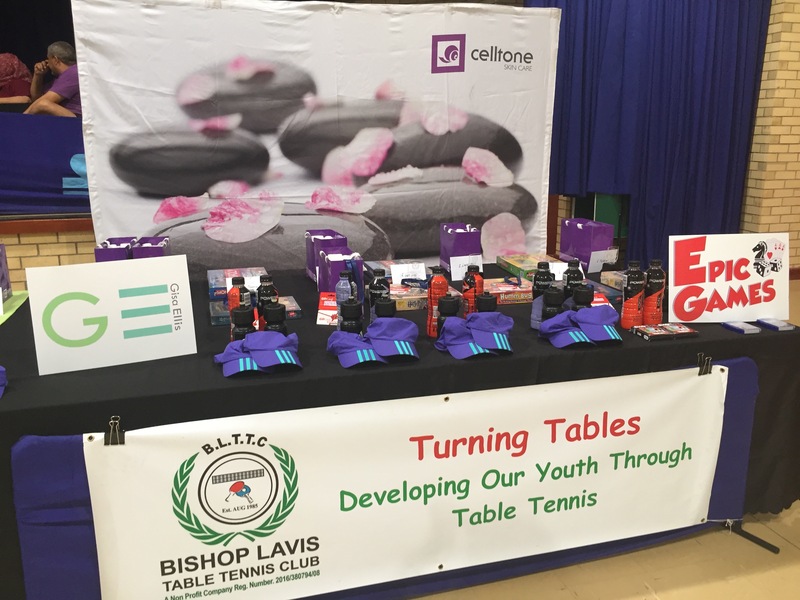 A great and successful day was had by all!